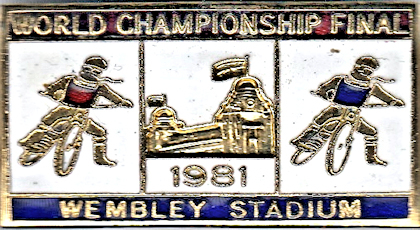 Wembley Stadium (previously the Empire Stadium) was the major sports venue in England. 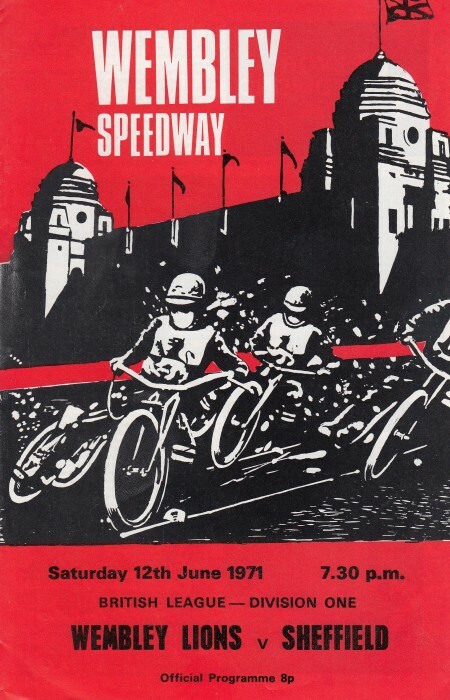 I was there in 1975 watching my ex Newcastle hero's Ivan Mauger & Ole Olsen take on the worlds best. 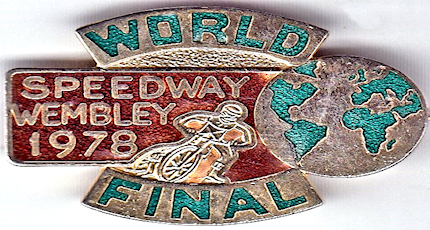 If you never attended this final. 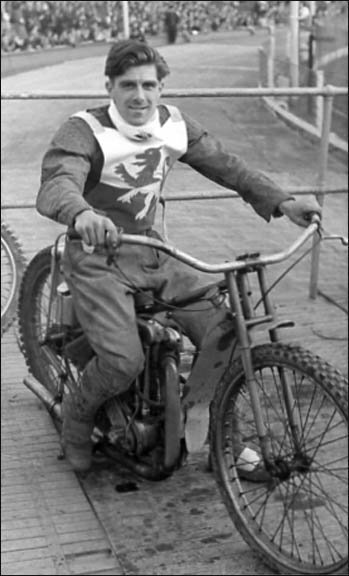 Ivan missed out in this one but my other ex Newcastle hero Ole Olsen won the world title. So I went home (To Newcastle) happy. My one and only visit from my north east home. 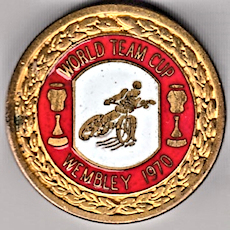 I was there amidst a massive crowd of 70/80 thousand, in 1975 when my ex Newcastle hero Ole Olsen was crowned world champion. 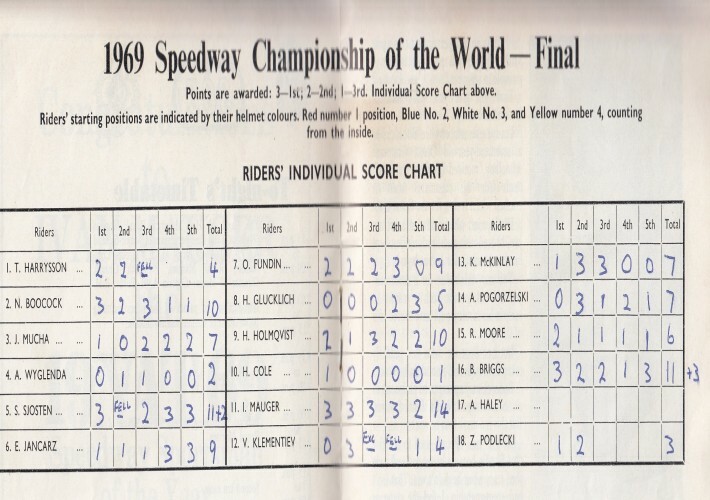 The track was too dry which upset some of the riders and some fans too. 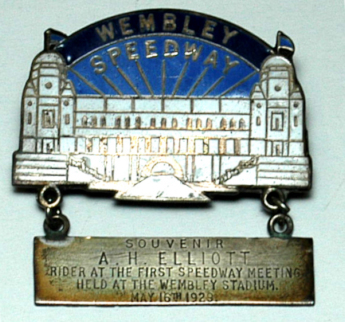 Norman Jacobs says: The first two are photos of the medals given to riders who took part at Wembley's opening meeting in 1929, They were issued to Billy Lamont and A H Elliott plus a photo of the 1932 team jumping over a hurdle. 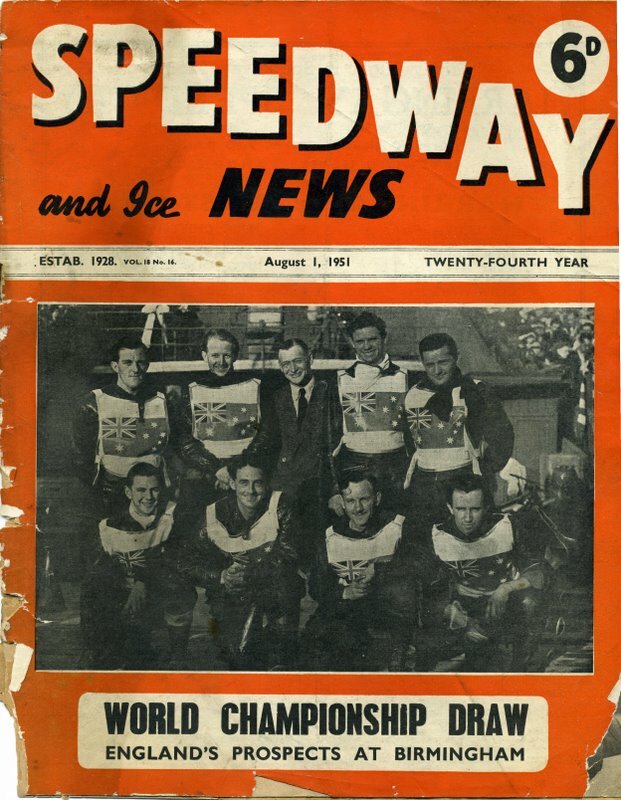 I can't quite identify them all, but as far as I can make out, they are, from left to right, Colin Watson, George Greenwood, ?, Ginger Lees, Wally Kilmister, Lionel Van Praag, ?, Norman Evans. 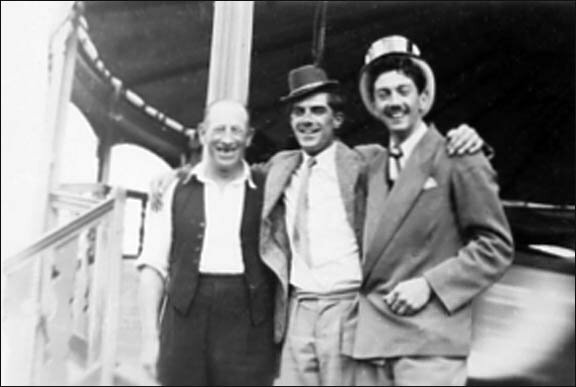 Of the 1932 regulars there are three missing, Harry Whitfield, Jack Ormston and Gordon Byers, so presumably two of the ?s are two of them, but I can't quite any of match them to the photo. 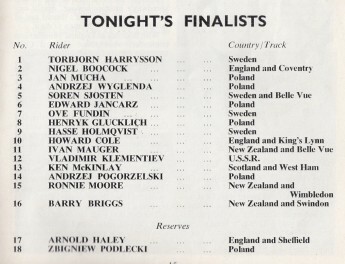 Hopefully someone reading will be able to put the names to them. 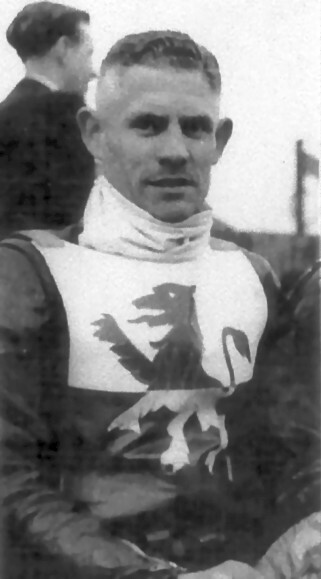 Roger Frogley won the British championship title of the 1929 Star Championship. 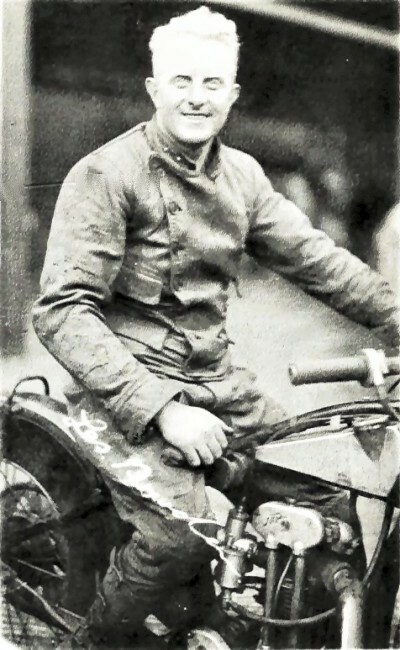 He is shown aboard a Harley Peashooter. 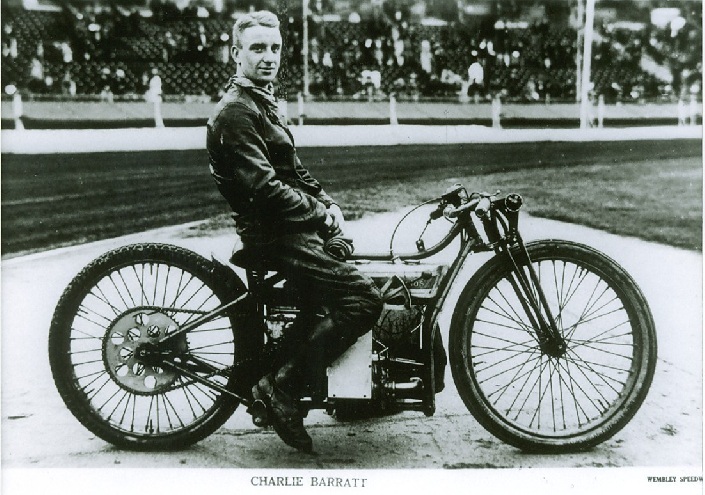 1929 The correct spelling of Charlie's surname is Barrett he came from West Hartlepool and was captain of his local side Middlesbrough before moving to Wembley. 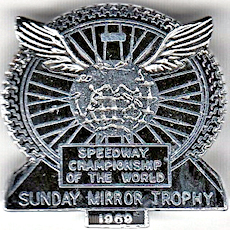 Daily Mail Trophy winners. 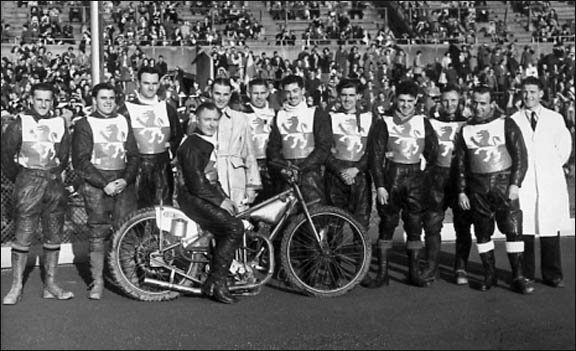 Back row: Cliff Parkinson, Col Stewart, Wally Kilmister, Lionel Van Praag, Charlie Shelton, Jack Jackson. 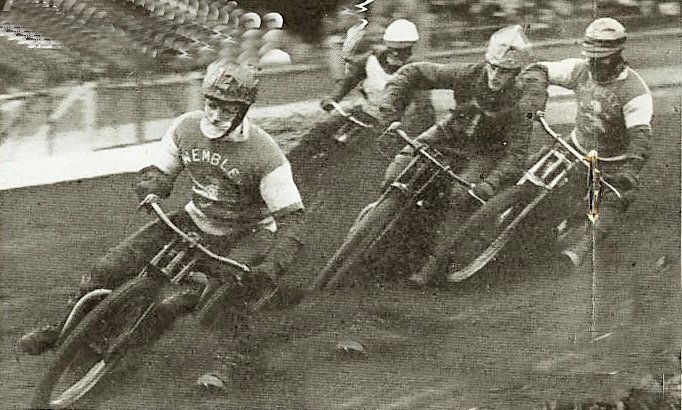 Front Row. 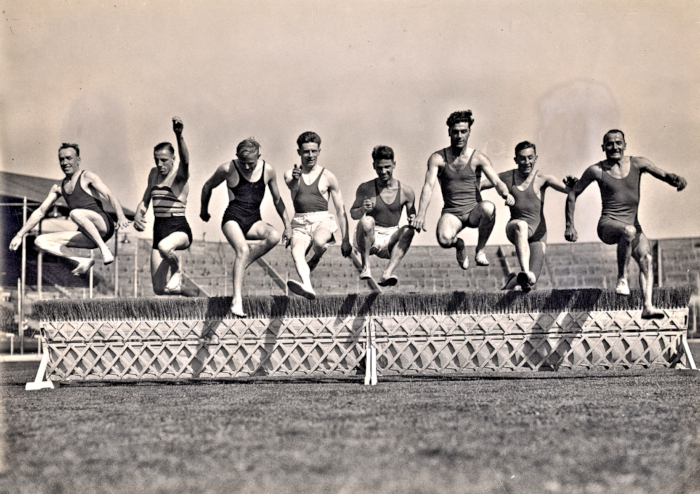 Buster Frogley, Norman Evans, Colin Watson (capt) Johnnie Hoskins, Jack Ormston, George Greenwood, Harry Whitfield. 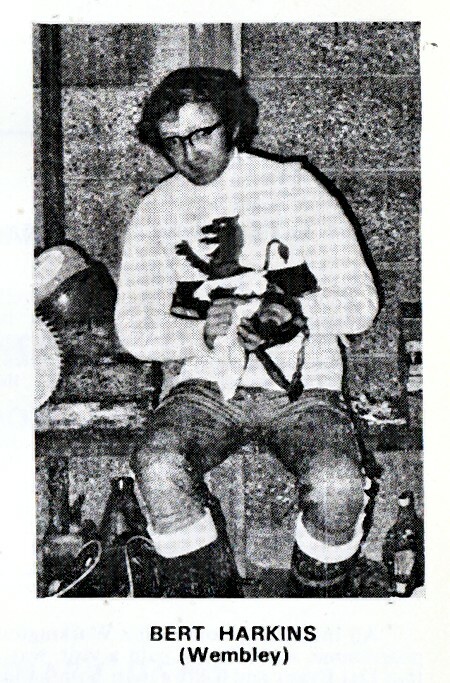 The mascot is Ian Hoskins. Update! 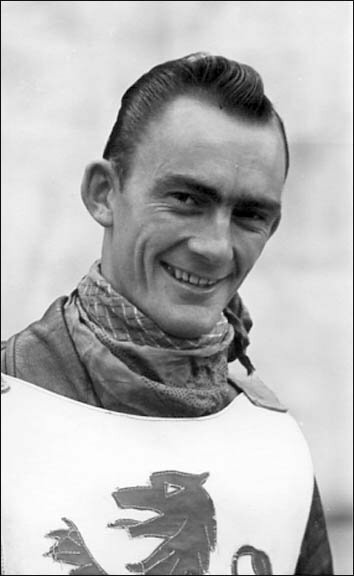 Sadly Gordon died aged 97. 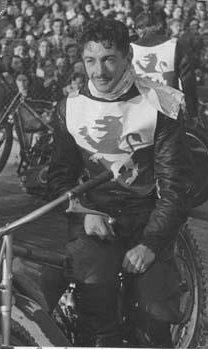 I had the honour of looking after him at a Newcastle reunion, he was living in the Gosforth area of Newcastle upon Tyne. 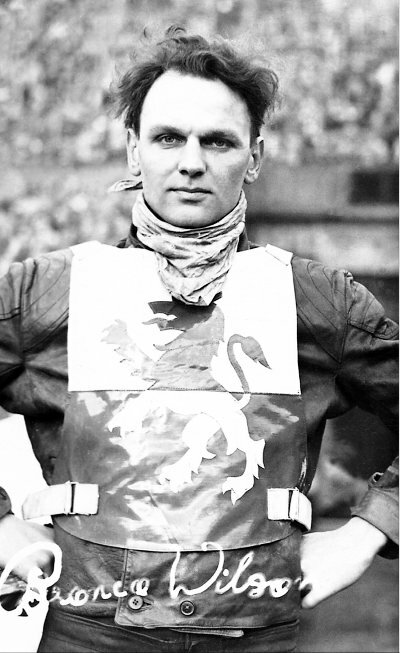 He was frail but had an active mind and regaled me with a lot of his memories. 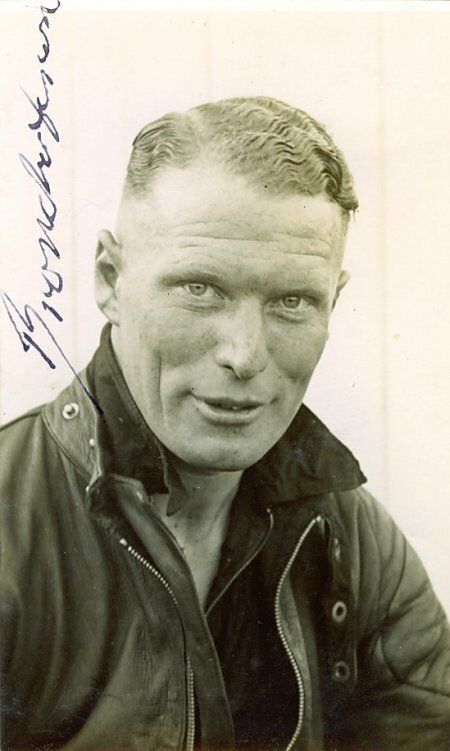 I hoped then that he would reach 100 yrs and was very upset when I heard he was no longer with us. 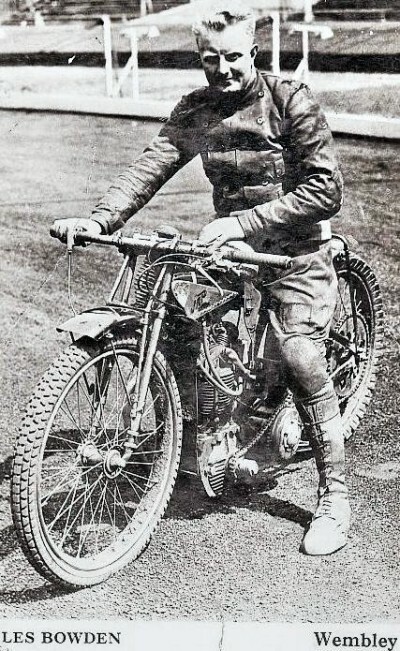 Charlie Barrett. 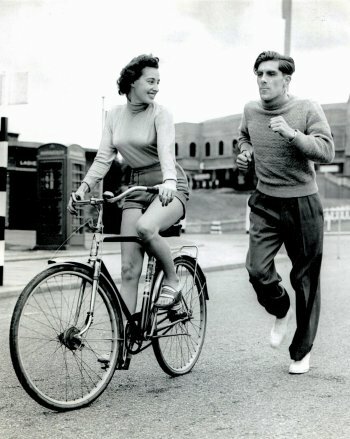 Middlesbrough. 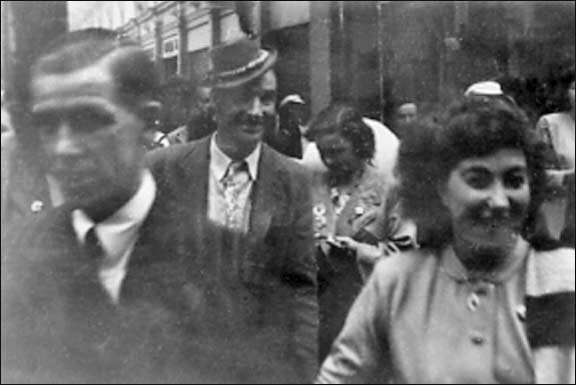 (Hartlepool I believe. )...near enough. 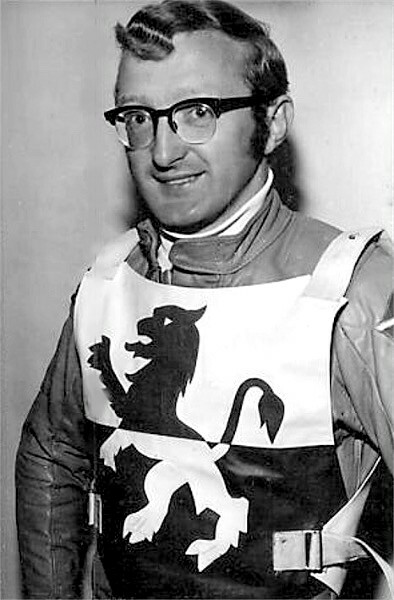 Jack Ormston. 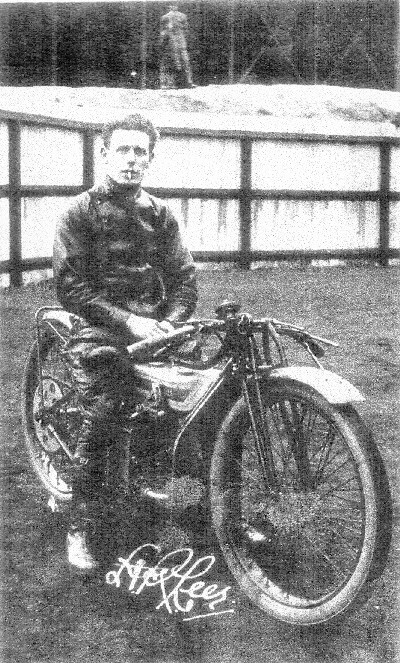 West Cornforth. 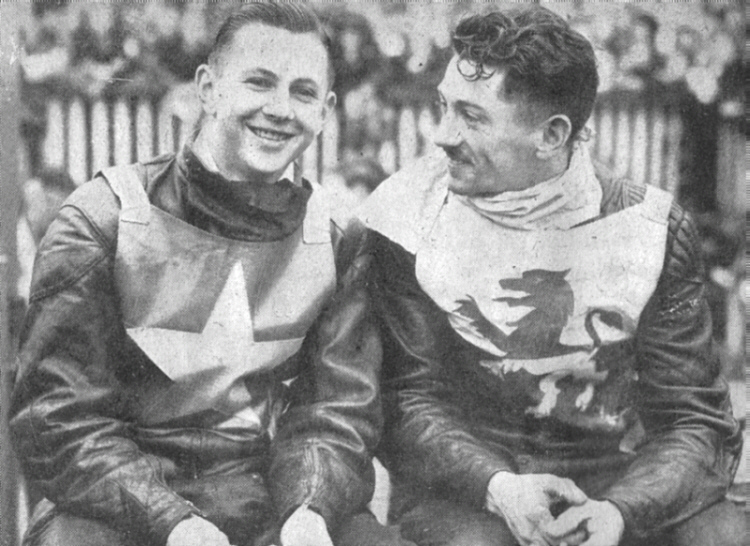 County Durham. 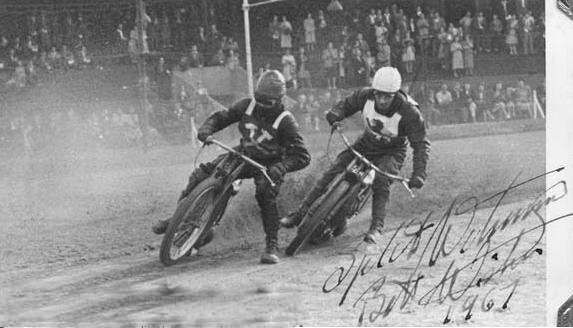 VSM says: The rider in front was Bobby Blake, anyone know the track? 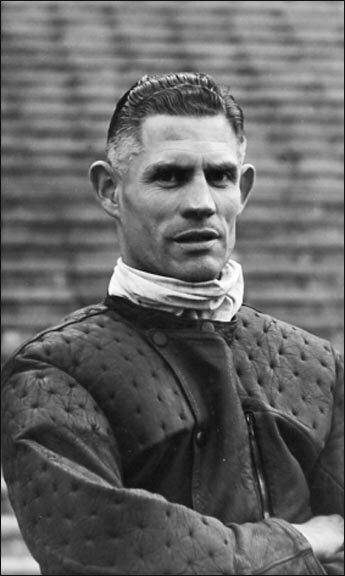 Jack "Bronco" Dixon ( I have also seen him named "Broncho") rode for Wembley in 1935. 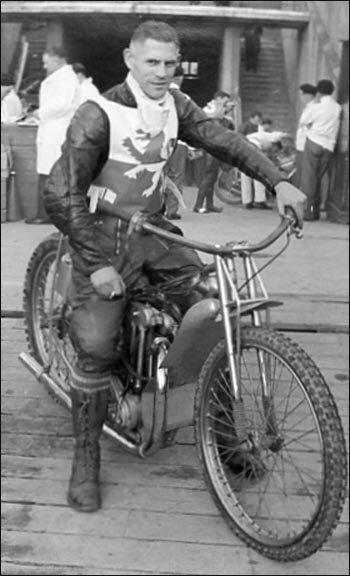 Fred Pallett says: Dixon rode at various times for Middlesbrough, Sheffield, Belle Vue, Wembley, West Ham and Hackney Wick. 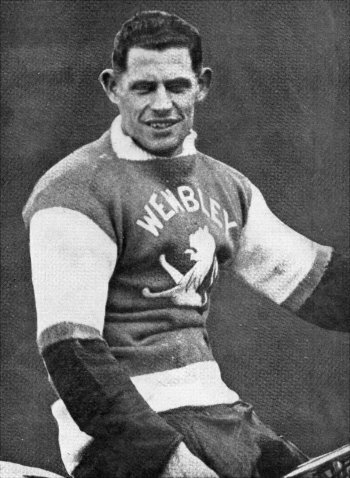 His spells with Wembley were in 1934 and 1935. My eyes are drawn to the ridiculously tall cup in the above picture. 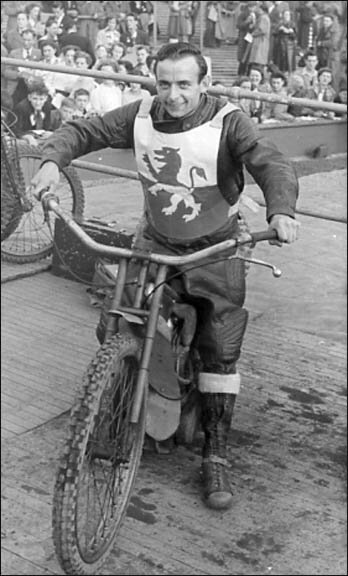 It was for the Scottish Open Championship, won by Wembley rider Harry Whitfield. 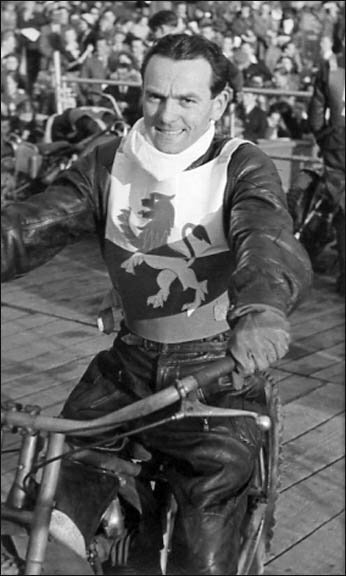 The rider doing a headstand was Norman Evans. 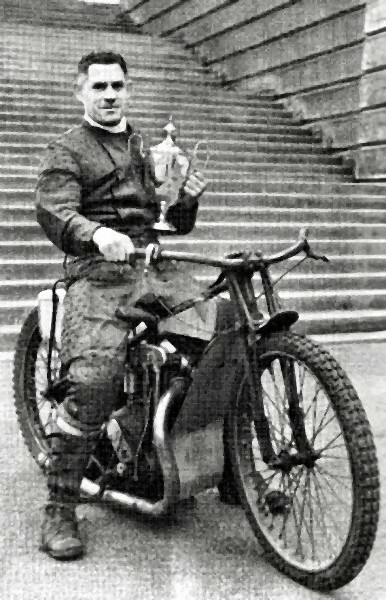 Harry Whitfield with an extremely large trophy he won in 1930 at the Edinburgh Marine Gardens track. 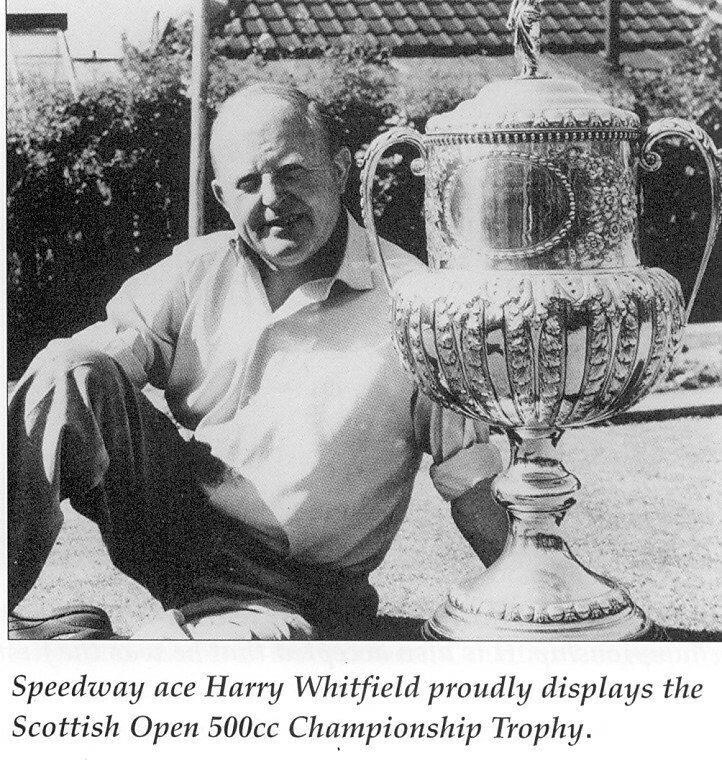 The trophy is 3 feet 6 inches in height and Harry was allowed to keep it plus the £100 prize money! 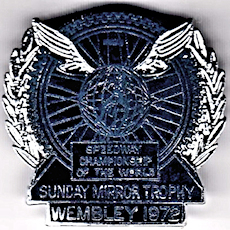 Is there a taller trophy in speedway? 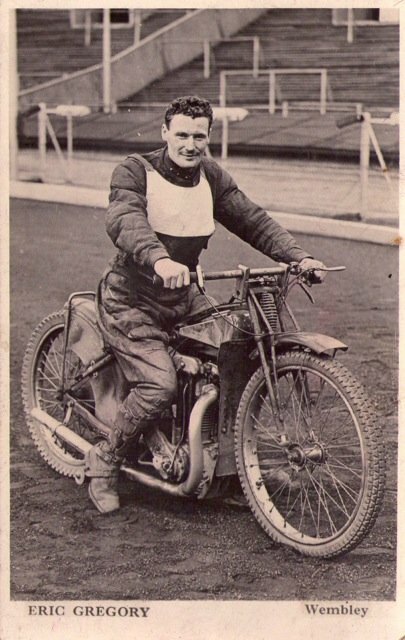 Sally Helvey says: My grandpa has just died aged 96 and I have found amongst his stuff two b/w postcards photos of Eric Gregory. 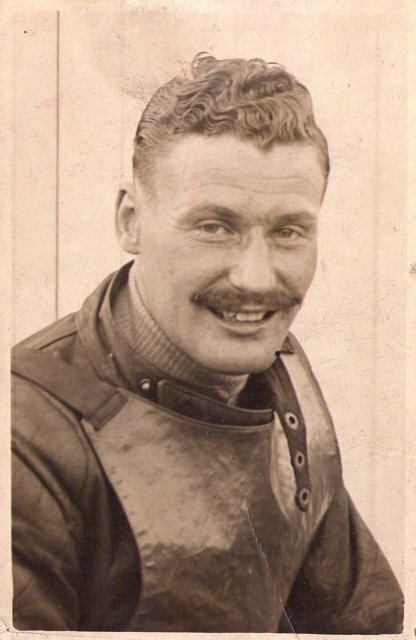 Both are publicity shots....one of him on his bike on the Speedway track at Wembley and another head and shoulders shot sporting a tan and his big moustache, with a racing bib on.and another head and shoulders shot sporting a tan and his big moustache, with a racing bib on. 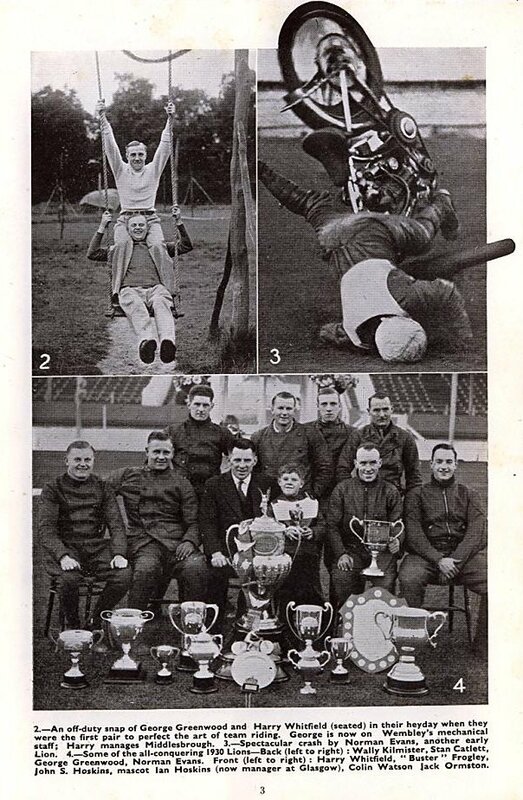 No doubt his descendants would be delighted to see these pictures, if indeed they don't have a pile of them already! Would you like me to scan and send them to you? No catches, no cost - i would just like them to end up where they belong. 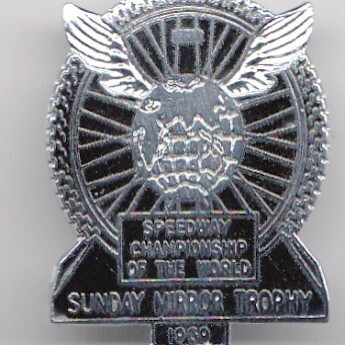 I don't think my grandpa supported Speedway particularly, but since these must be dated around 1937, they might have been given to him by Eric if/when they spent time together as POWs during WW2. You might be able to shed light on this. 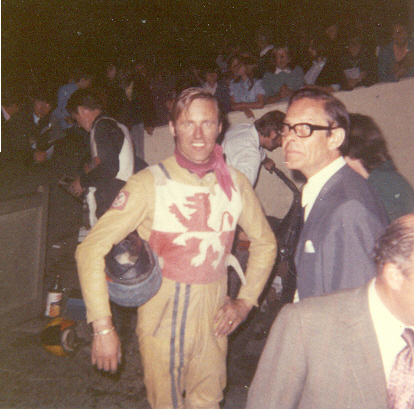 I have contacted you because by Googling his name, I spotted Eric on your existing website photos. They've come out well, haven't they? 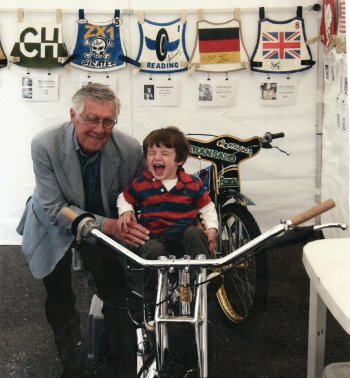 Eric's grandson Mark Gregory says: Hi I am one of Eric Gregory's four grandchildren Mark Gregory. 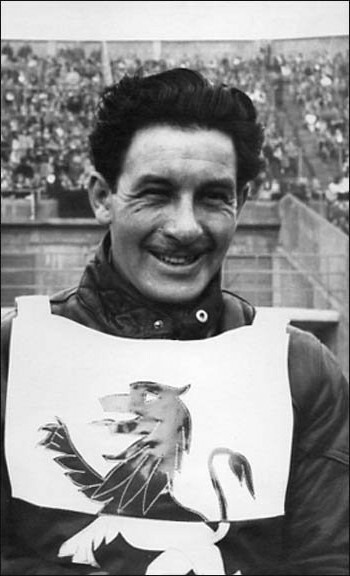 He died around 1988 in Durban South Africa having moved there following the death of his wife. 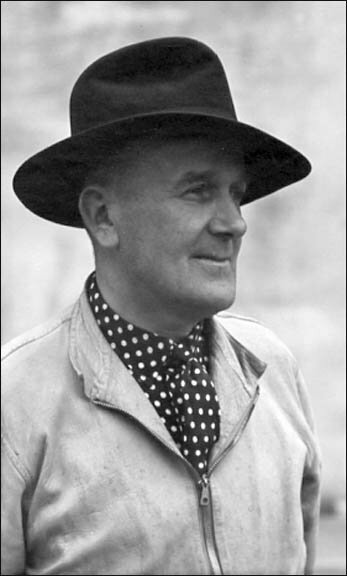 His only son: Antony Eric Waterson Gregory (my father) died in 2004. 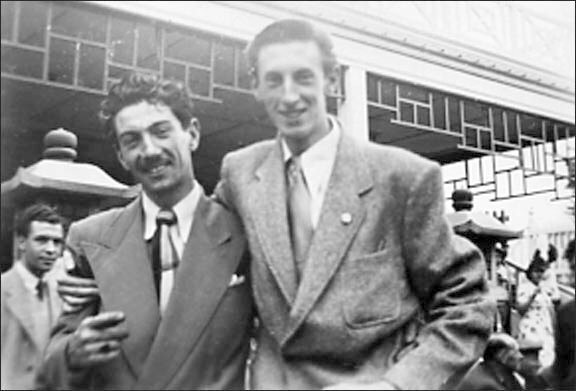 From memory Jim was Eric's brother (remember him vaguely at my Grandmothers funeral). 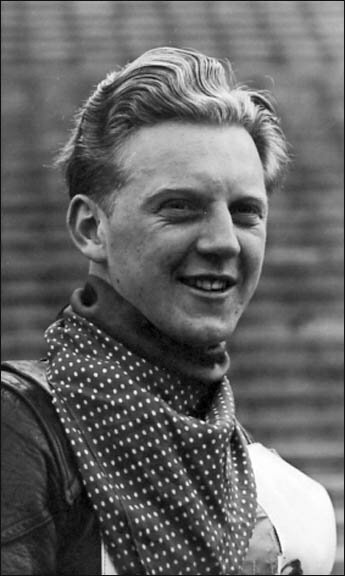 Whilst Grandad was indeed an Officer in the Army over WW2 period I don't recall him ever saying he was a POW. 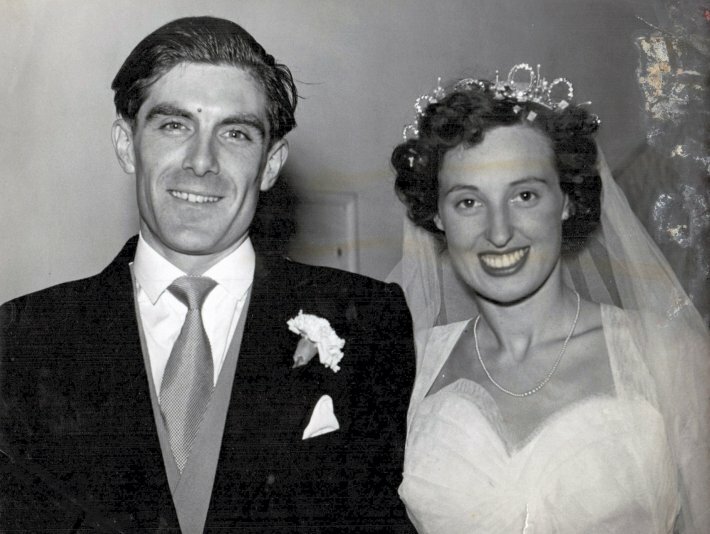 I just remember him for being a kind and loving Grandfather who came once a month from 1971-1980 for Sunday lunch with a paper bag full of chocolate bars. 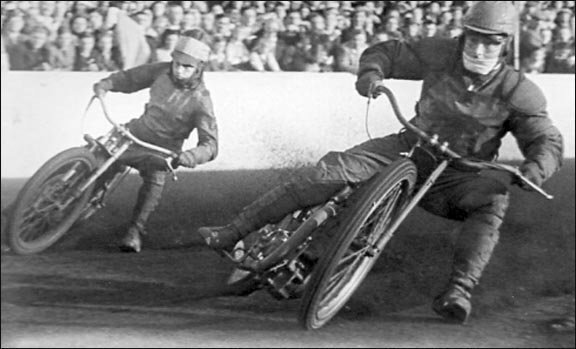 This photograph goes up on my wall as one of the best speedway pics of all time! 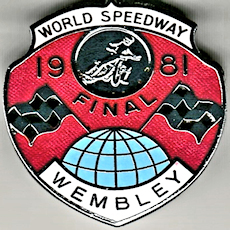 Wembley like most of the other speedway clubs in the UK was brought to a standstill by the second world war. 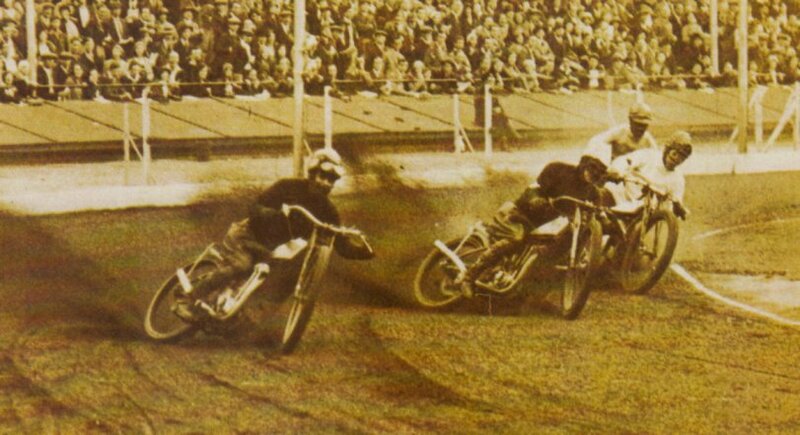 I believe Belle Vue managed to run a few meetings during the hostilities, correct me if I am wrong! 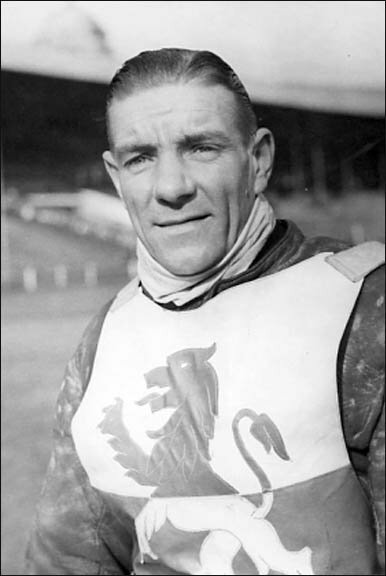 John Skinner says: Yes in 1939, my team, Newcastle were sitting pretty, top of their league. 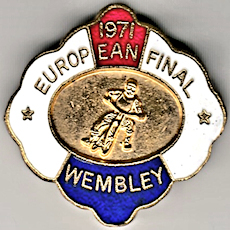 We were heading for the clubs first major trophy. 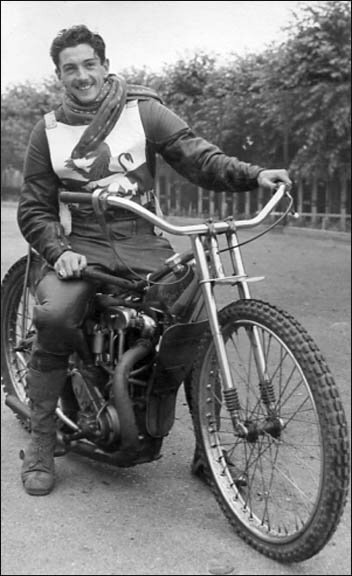 Then Adolf Hitler "spitefully" dashed the Diamonds hopes of glory by invading Poland and consequently starting World War Two. 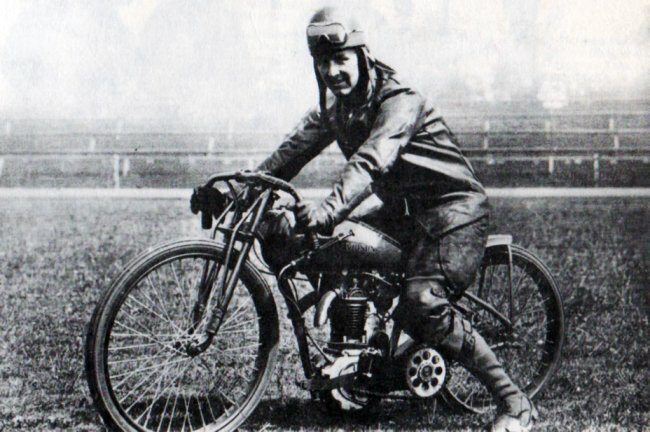 Due to the war, Newcastle's top man Canadian George Pepper took to the skies (not only a speedway rider, George was also a pilot) and he lost his life due to the war, when his plane crashed on a training flight. 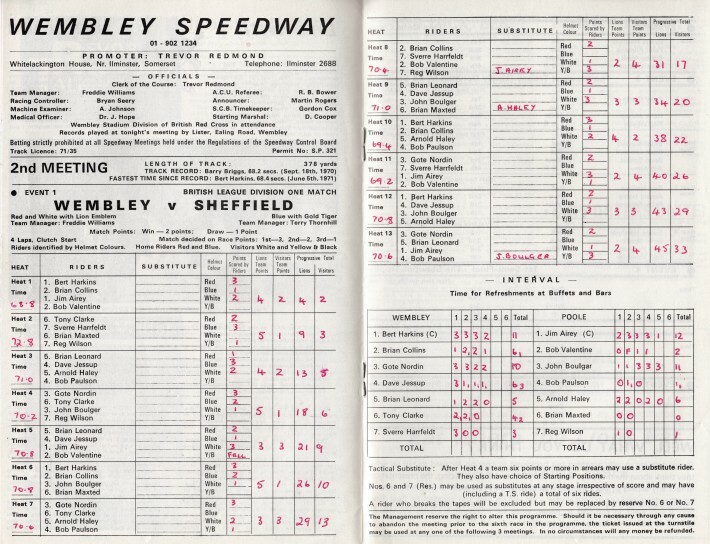 The Empire Stadium started speedway again in 1946 as members of the National League. 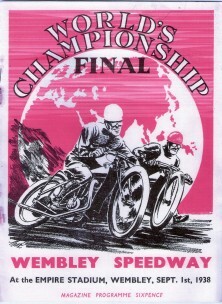 Wembley became the nation's home venue for world championship finals. 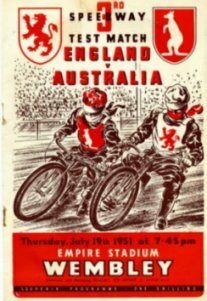 Professor David Cheeseman says: As a schoolboy I used to attend the Speedway at Wembley Stadium where my father would often be on duty as a member of the British Red Cross Society. Accidents were frequent and needed BRCS attention. 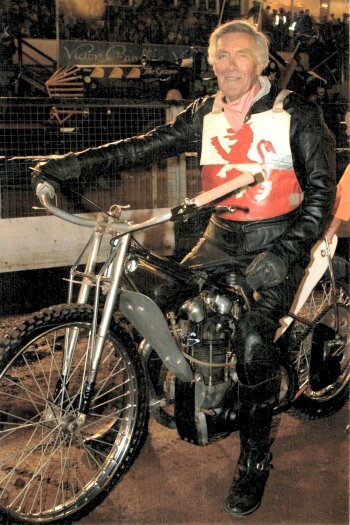 I remember an occasion (I was not actually there that night) when a rider fell and was trapped with his head under the gravel board at the foot of the safety fence. 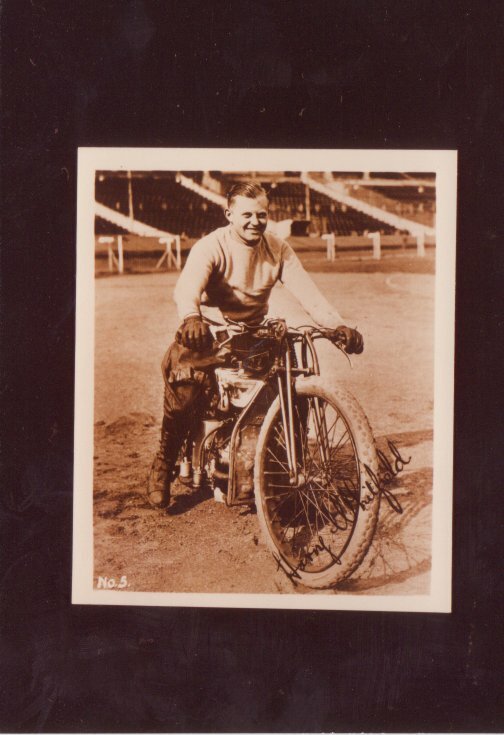 My recollection is that it was Bronco Wilson, but I cannot be sure. I wonder if you can confirm this. 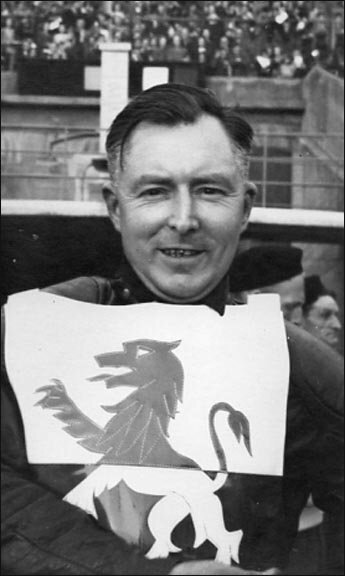 On a separate point I think you will find that BAOR stands for British Army of the Rhine, not as printed. 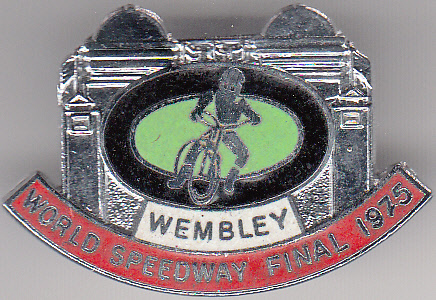 I was a pupil at Wembley Hill School destroyed but not demolished by a doodle bug (V1) in 1944. 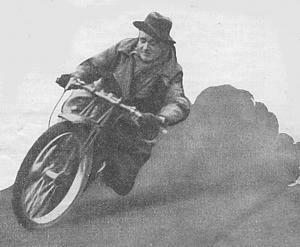 By then I had left to go to Willesden Tech. 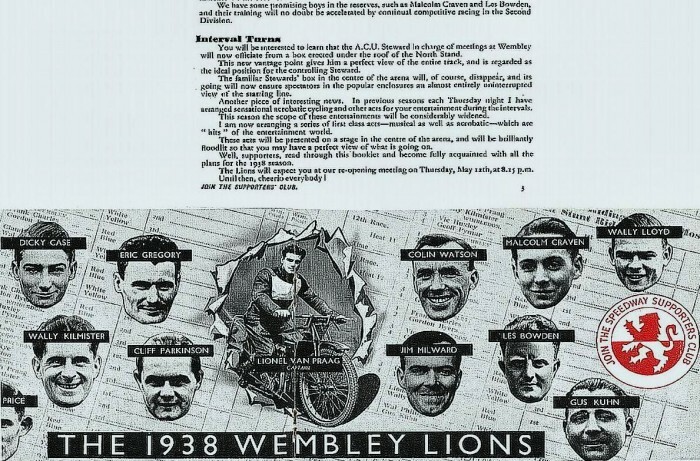 Fred Pallett says: Hello John, I have noticed that, just above my 1946 Wembley team photo, there is a para by Den Sullivan in which he recalls his memories. 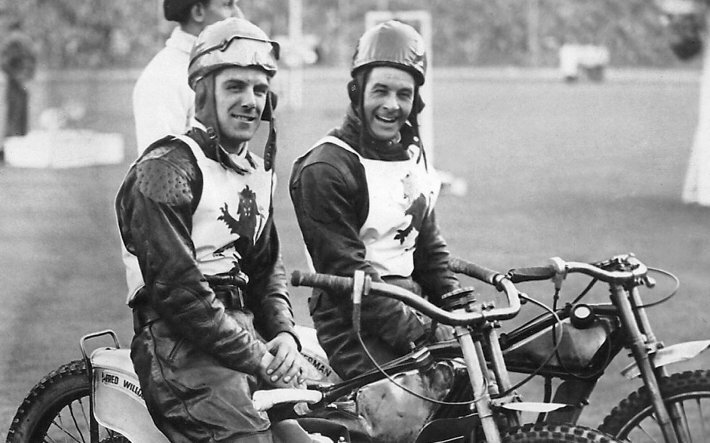 He recalls the riders he saw at his first meeting at Wembley in 1946. 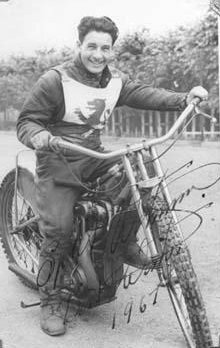 Unfortunately, he erroneously remembers seeing Bluey Wilkinson - not in 1946 he didn't, as Wilkinson never rode in the UK after WW2. 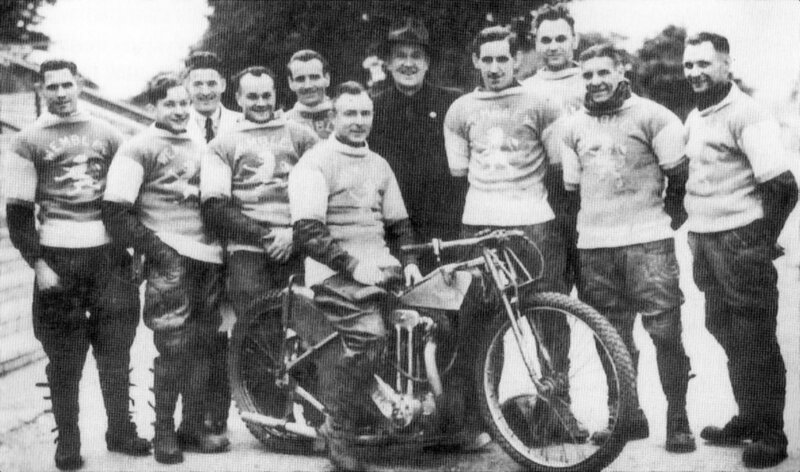 Wembley team 1946 (left to right: Tommy Price, Charlie May, Tommy Barnett (Chief mechanic), Roy Craighead, Bill Gilbert, Alec Jackson (Team manager), Alf Bottoms, Bronco Wilson, Bob Wells, George Wilks, and Bill Kitchen (Captain) on bike. 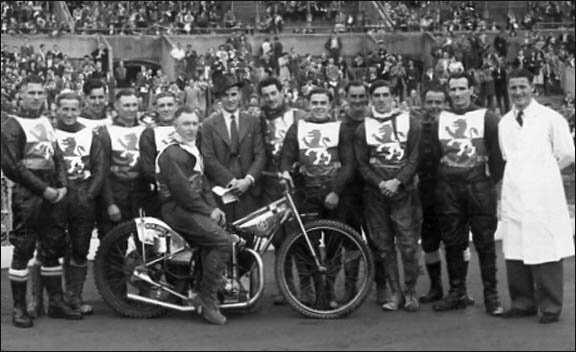 Wembley 1947: Tommy Barnett (Chief mechanic), Tommy Price, Bill Gilbert, George Wilks, Charlie May, Alec Jackson (Team manager), Alf Bottoms, Split Waterman, Roy Craighead, Bob Wells, Bronco Wilson, and Bill Kitchen (Captain) on the bike. 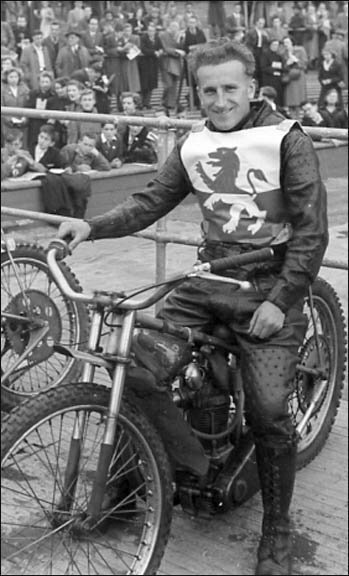 Fred Pallett says: Hello John, The above image is another Wembley rider for your website. 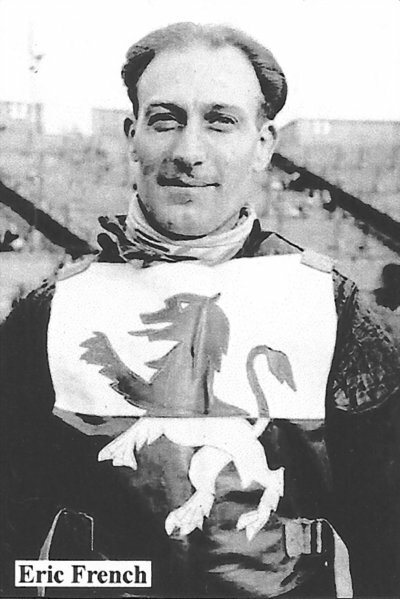 It is Charlie May, who rode for the Lions in 1946 and 1947. 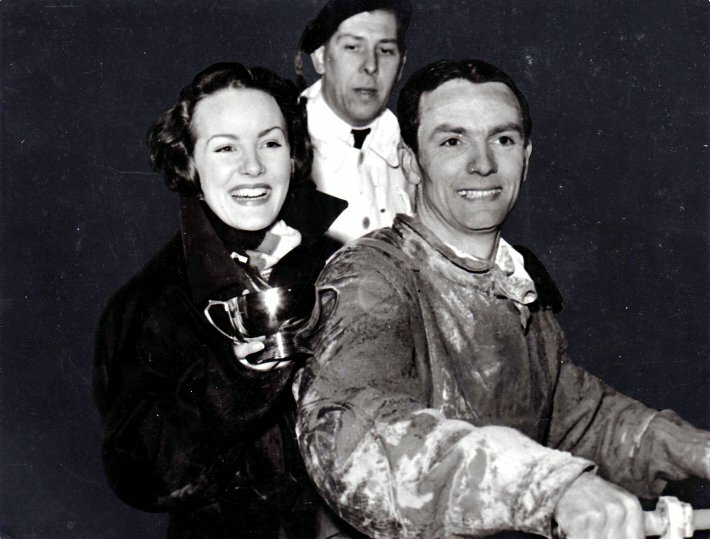 I believe the image dates from 1947. It should measure 6" x 4", although it looks larger than that on my new iPad! 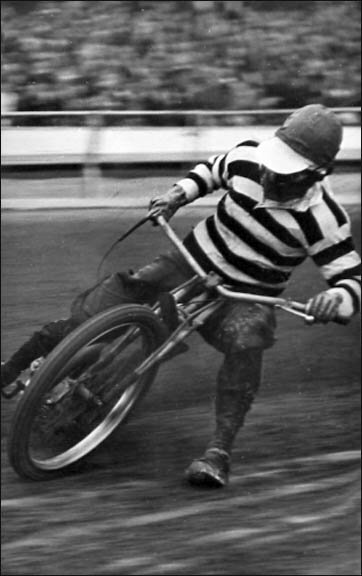 John says: The image has just the resolution I like. 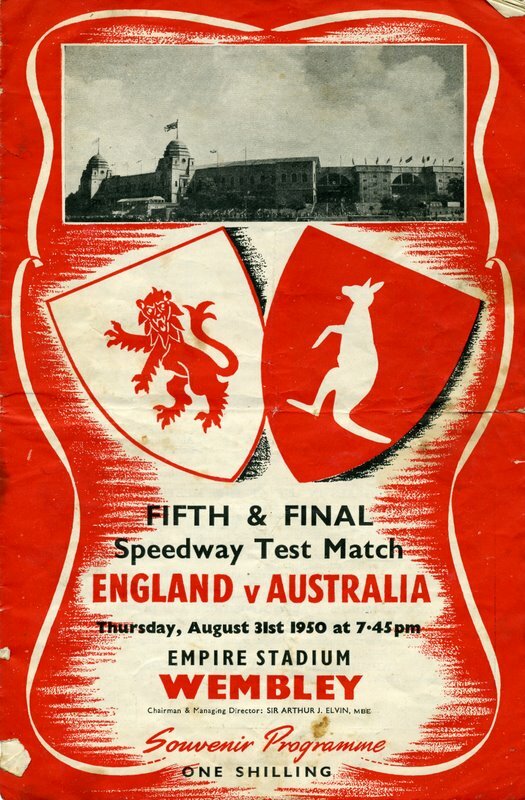 I have posted it above, quite large and doesn't it look great! 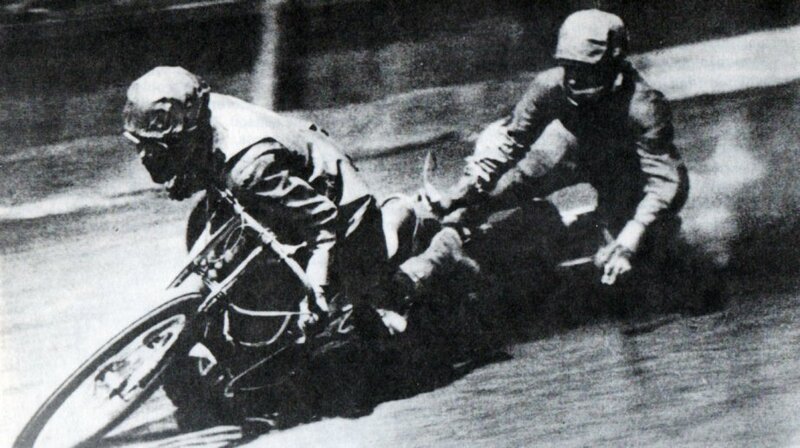 Charlie astride a Martin JAP. 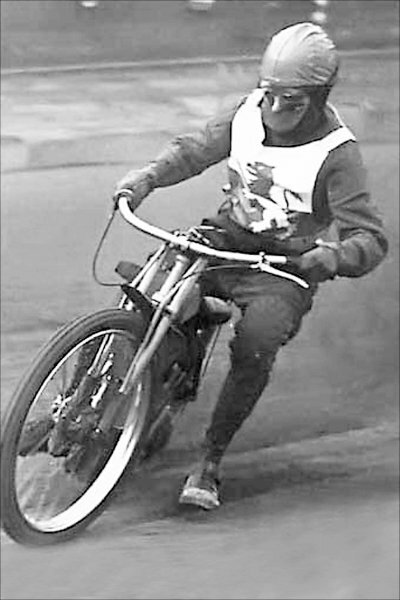 John says: My friend Archie Cooper took this excellent long focus shot from the spectators side of the fence, Archie is now in his eighties and still watches Newcastle Diamonds most weeks. 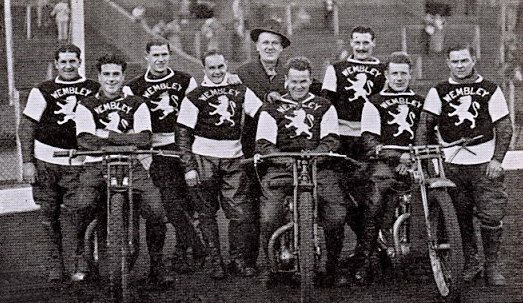 Wembley 1948: Tommy Barnett (Chief mechanic), Bill Gilbert, Fred Williams, Unknown (possibly Kemp), George Saunders, Roy Craighead, Bruce Abernethy, George Wilks, Bob Wells, Wilbur Lamoreaux, Tommy Price, Split Waterman, Alec Jackson (Team manager), and Bill Kitchen (Captain) on the bike. 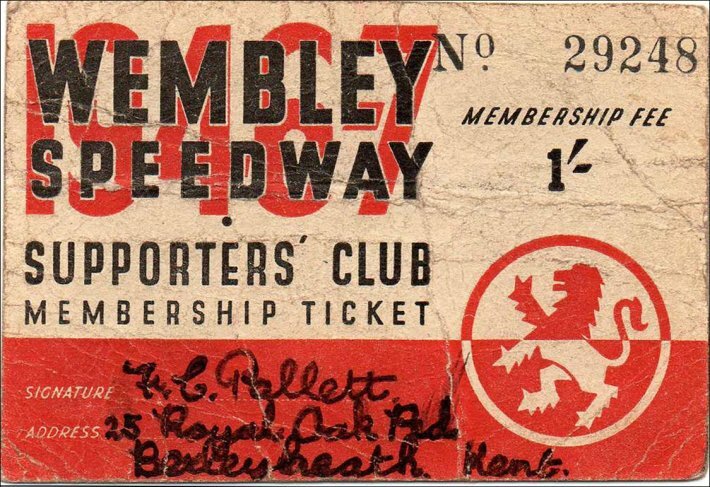 John says: Fred Pallett was a fully paid up member of the Wembley supporters club from 1948 to 1954 inclusive. 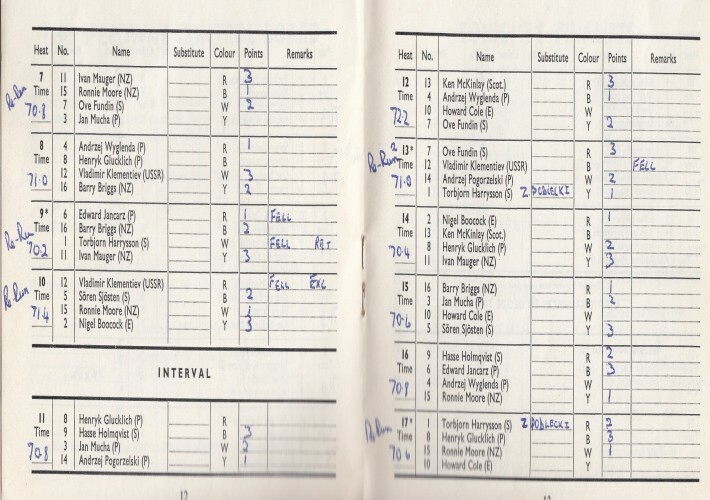 I am showing here an example of the cards he has saved all this time. So if there is a mathematical genius reading this! 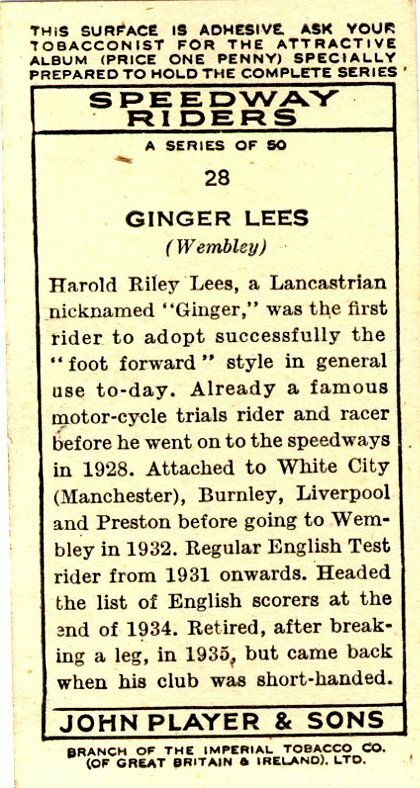 How much was 1/- (5p) worth in 1948! 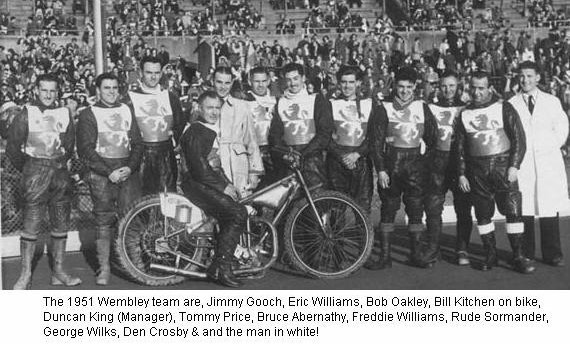 Wembley 1949: Tommy Barnett (Chief mechanic), Fred Williams, Jack Gates, Alec Jackson (Team manager), Bruce Abernethy, Den Cosby, Alf Bottoms, Bob Wells, Bill Gilbert, Tommy Price, Buster Brown, Split Waterman, and Bill Kitchen (Captain) on the bike. 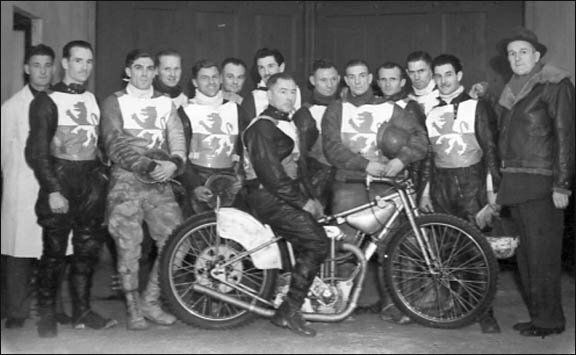 Wembley 1950: Tommy Price, Jimmy Gooch, Alf Bottoms, George Wilks, Bob Wells, Duncan King (Team manager), Bruce Abernethy, Eric Williams, Jack Gates, Fred Williams, Den Cosby, Bill Gilbert, Tommy Barnett (Chief mechanic), and Bill Kitchen (Captain) on the bike. 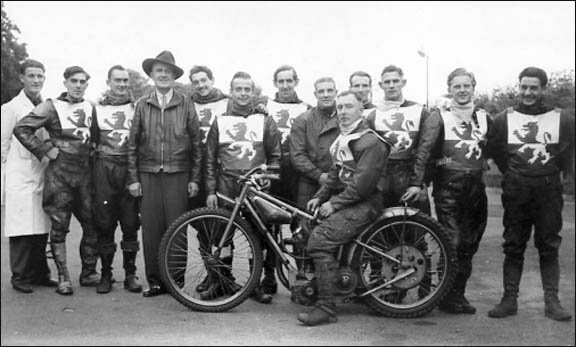 Wembley 1951: Jimmy Gooch, Eric Williams, Bob Oakley, Duncan King (Team manager), Tommy Price, Bruce Abernethy, Fred Williams, Unknown, George Wilks, Den Cosby, Tommy Barnett (Chief mechanic), and Bill Kitchen (Captain) on the bike. 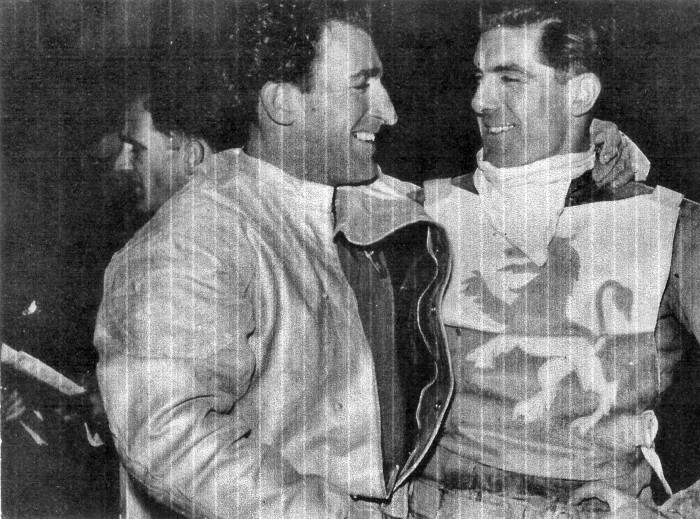 Fred Pallett says: In the 1951 Wembley team photo, the man in the white coat on the right is Tommy Barnett, who was the team’s chief mechanic. 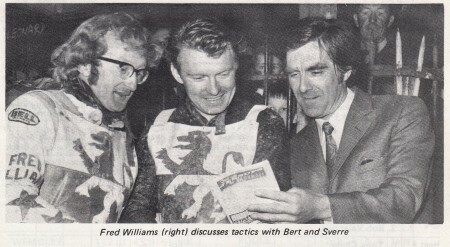 Fred also says: the caption for which states that the fourth person from the right is Rune Sormander. 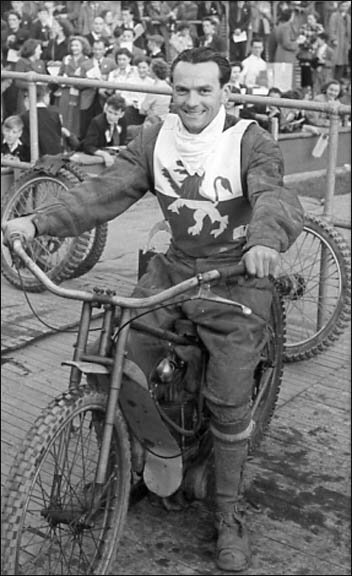 I have my doubts about this, as my recollection is that he was a British Wembley junior rider, but I cannot recall his name. 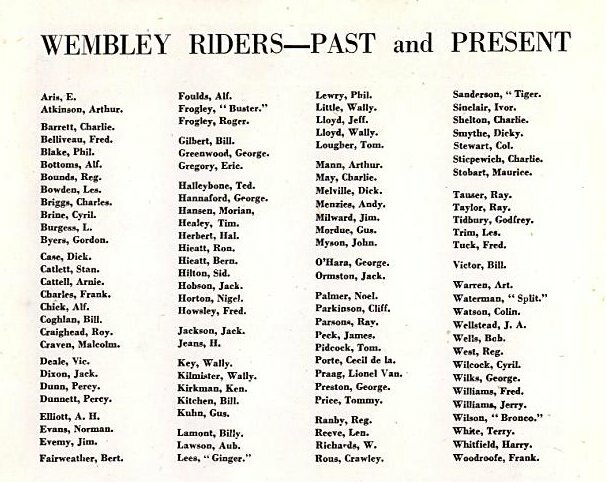 Stenner’s Annual for 1952 does not include Sormander in the list of Wembley riders for 1951. 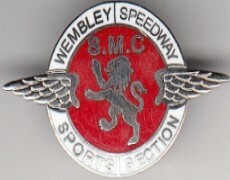 In his book “Speedway in London”, Norman Jacobs states that Sormander joined Wembley in 1953. 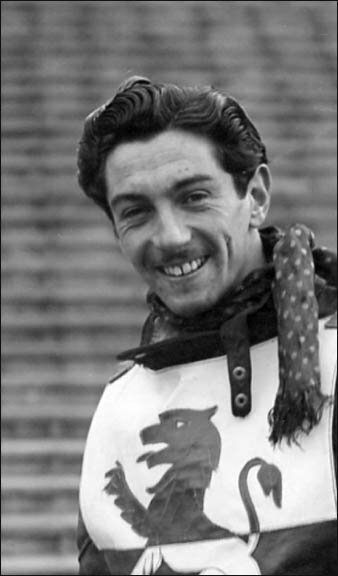 Stenner’s Annual for 1954, in reviewing the 1953 season, states that Wembley “bought 18-year-old Brian Crutcher from Second Division team Poole for £2,500. 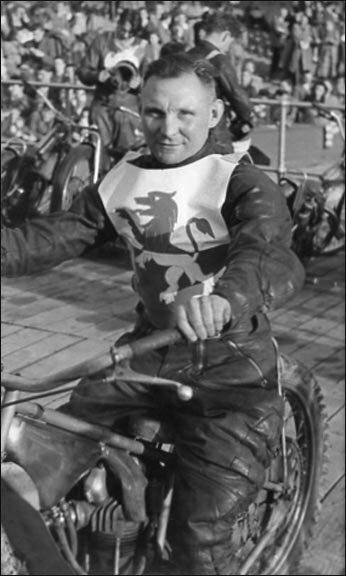 A week later, with George Wilks temporarily out of action, they ‘borrowed’ Swedish rider Rune Sormander”. 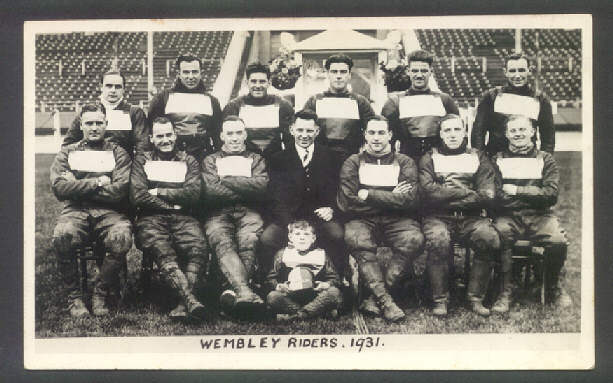 It seems clear, therefore, that the mystery guy in the 1951 Wembley team photo is not Rune Sormander, as the photo was taken two years before he arrived at Wembley. 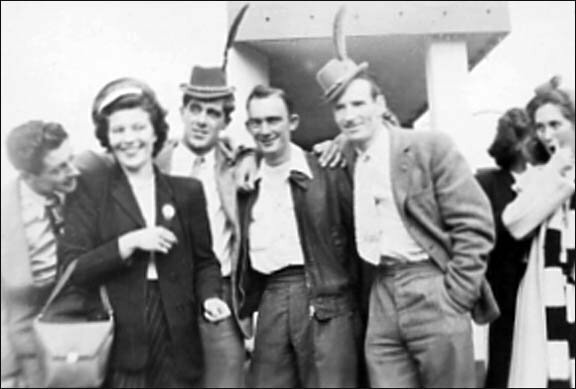 Fred Pallett says: In the 1951 photo, the fourth person from the right was unknown to me at the time (I had previously disputed the claim by someone else that it was Rune Sormander). 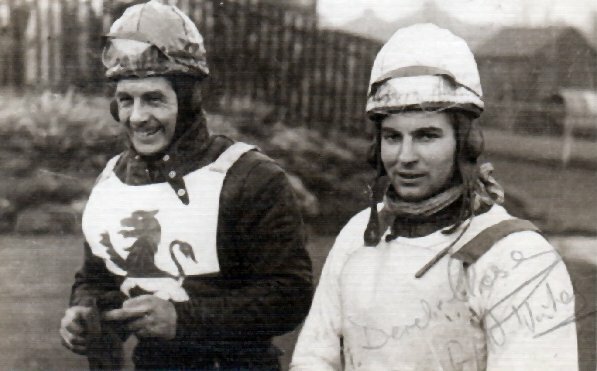 I have researched this further and can now tell you that the unknown person was Dennis, or possibly Denis, Cross. 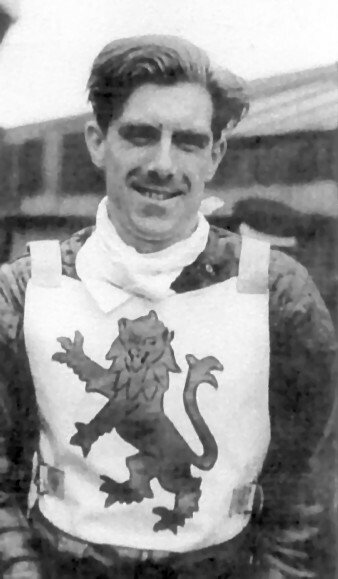 Cross never made it to Wembley’s first team, but represented the Lions in various Junior League races during that year, invariably partnered by Den Cosby. 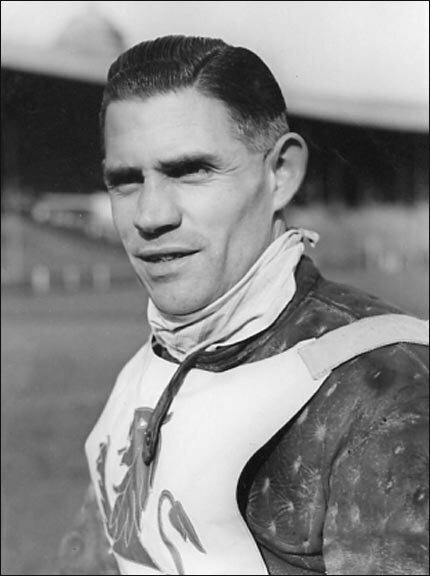 Poor Dennis never made the grade and I believe that he was not retained by Wembley at the end of the 1951 season. 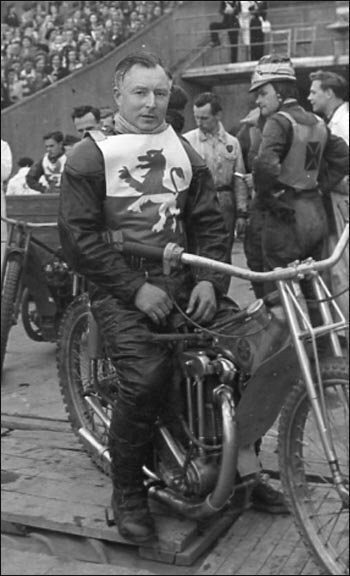 As far as I am aware, apart than those who appeared in the team photo for 1951, no other rider was on Wembley’s books for that year. 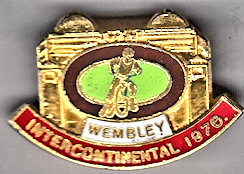 Fred says: As a teenager, I was an avid Wembley supporter from about 1947, until 1952 when I was called up for my National Service. 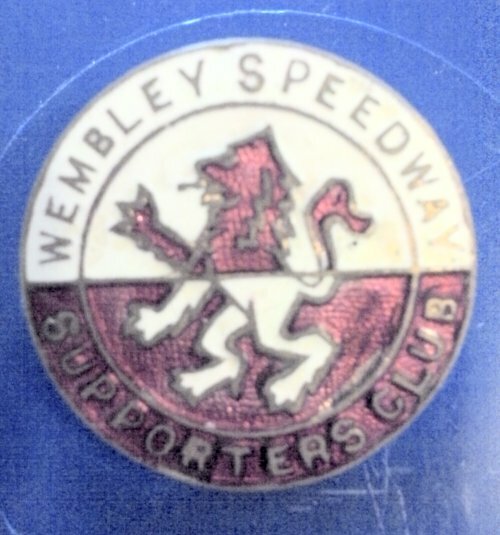 Although then living on the opposite side of Greater London at Bexleyheath, I travelled the 25 miles to the “twin towers” stadium by public transport every Thursday evening for Wembley’s home matches, not returning home until after midnight. 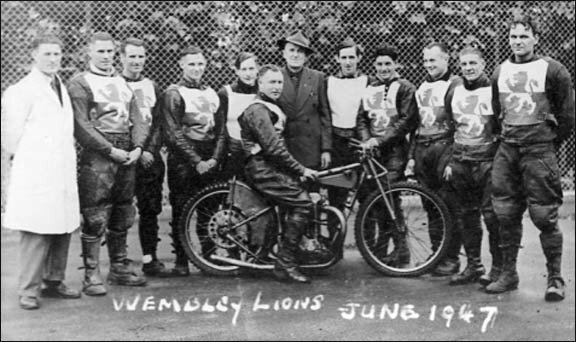 Additionally, I followed the Lions to most of their away matches in London which, at the time, boasted five tracks. 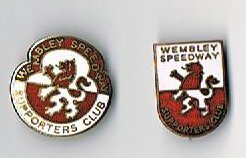 Consequently, I could be found at Wimbledon on a Monday, West Ham on a Tuesday, New Cross on a Wednesday, or Harringay on a Friday – although not all in the same week! 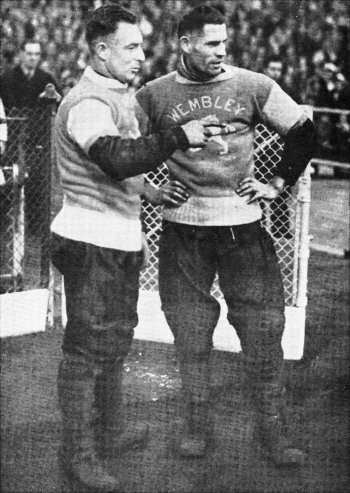 It was fortunate that Wembley’s colours were red and white, so I was able to use my scarf and rattle for Charlton Athletic, of which I am still an active supporter. 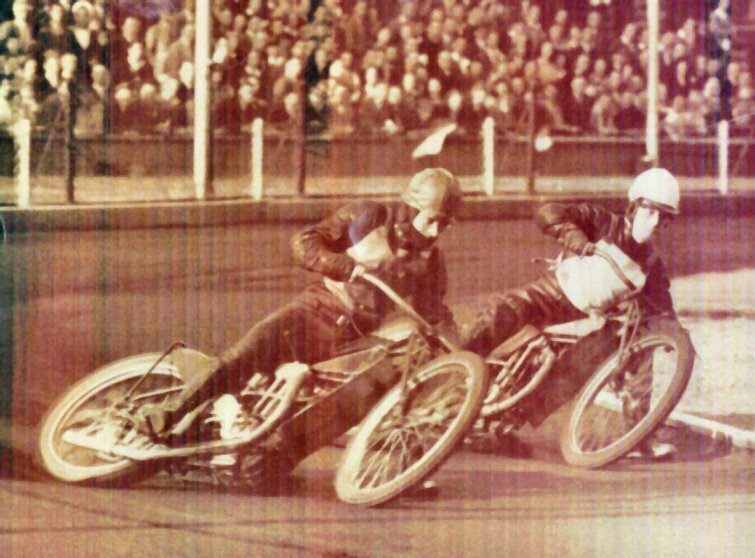 Split Waterman (left) and George Wilks (right), holding off West Ham’s Aussie Cliff Watson (circa 1947). 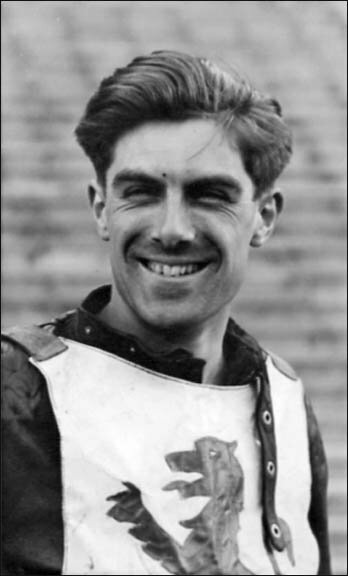 Fred Pallett says: Top English Rider: Tommy Price, the photos span 1946-1951. 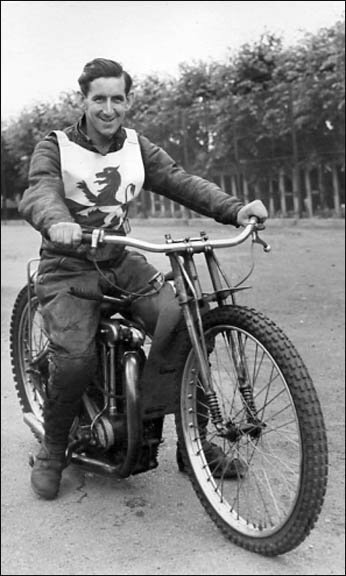 The 7th Photo was taken after he won the British Riders Championship in 1946. 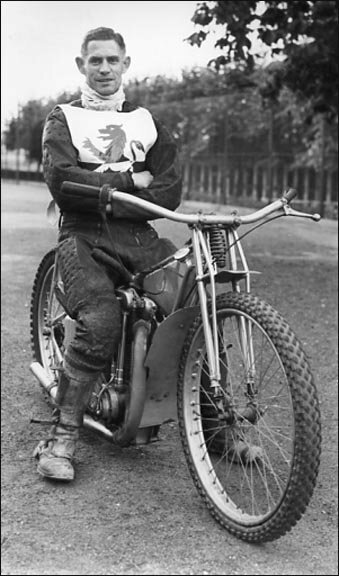 I think it is a particularly good photo that deserves a place in your Wembley section. 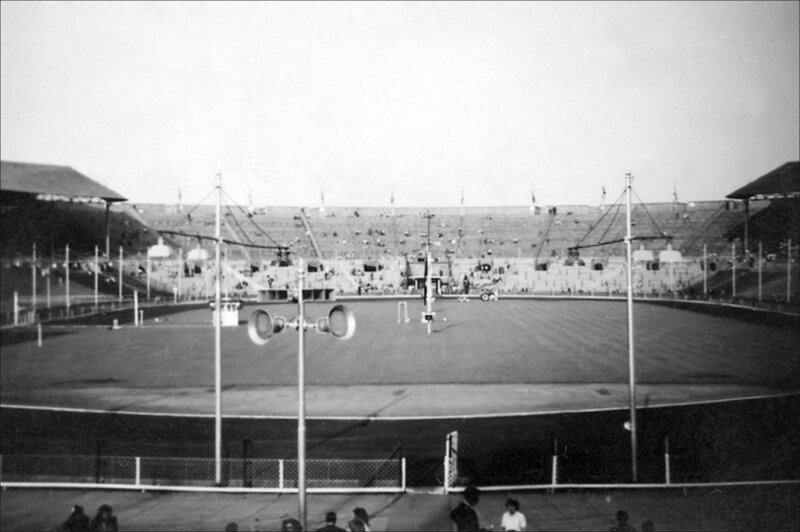 Looks like the steps are those that provided an entrance to the original Empire Stadium. 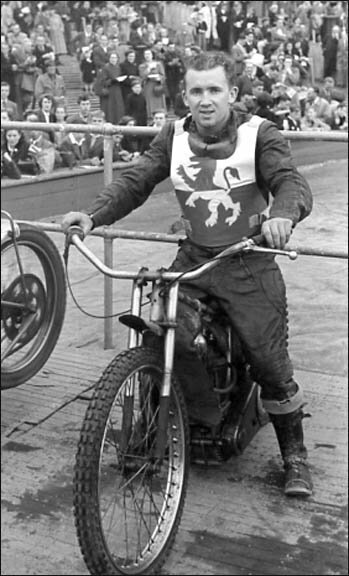 Ken says: Can you recommend a book* that I can purchase which has photo’s and stories about The Wembley Lions, and in particular my first ‘Hero’,Tommy Price? 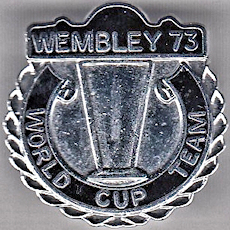 Mum & Dad used to take me to watch matches at Wembley, (dad was a school-chum of Bill Slocombe), when I was very young. 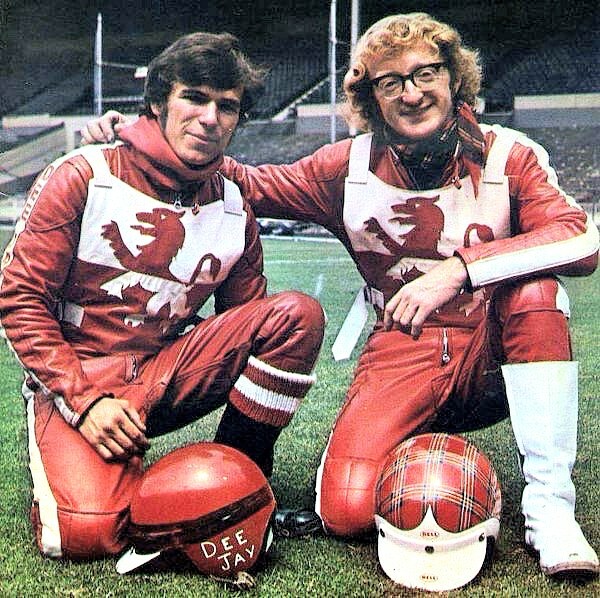 I remember, to this day, cheering on Tommy (wearing his favourite red helmet), whilst I wore a Red & White suit that Mum had made for me. 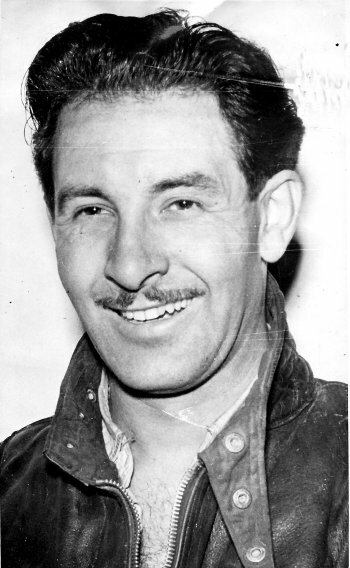 Dad introduced me to Tommy in person on a Saturday at his work at British & Colonial Concessionaires in St Martins Lane, which sold & repaired all American Cars for those who could afford them, (mostly Showbusiness Stars, and in this instance my personal Hero!) I was speechless, mouth agape, & could barely walk towards him! 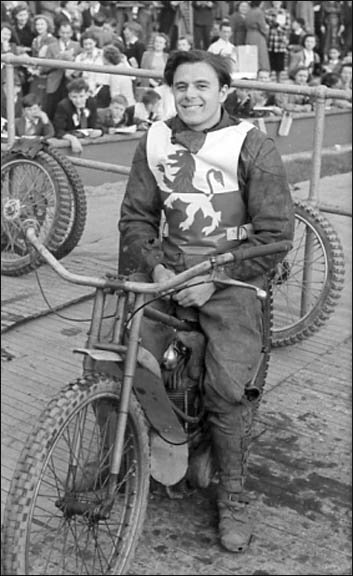 He ‘ruffled’ my hair saying “Hello Kenny!”. It was like meeting a God. 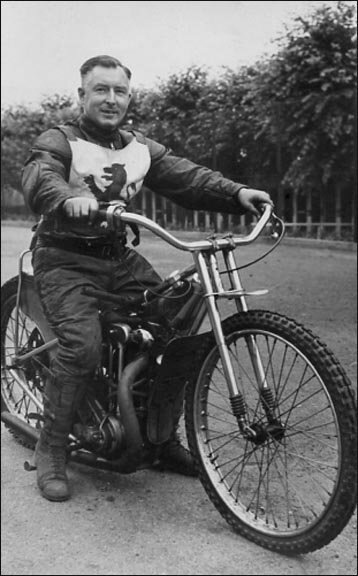 I barely slept that night & could hardly wait to get on my bicycle next day to emulate him, front wheel awry as I cornered on the cinder track at Paddington Recreation Ground. 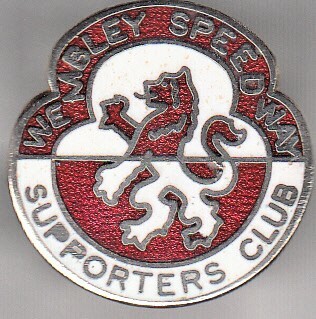 I still have my Wembley Lions Members Badge, which is one of my most treasured possessions. 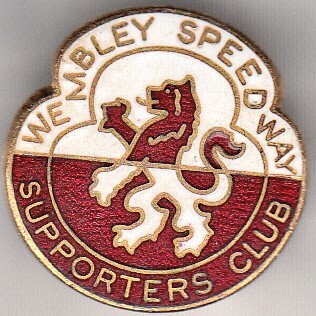 The Wembley ‘Roar’, the smell of ‘Castrol R’, and the memory of Tommy winning again will never leave me! 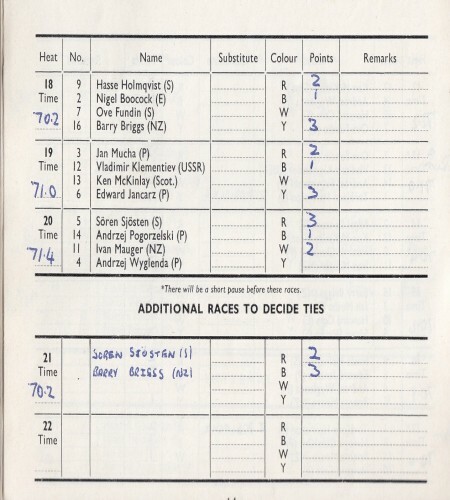 I am sure that there is a book out there that will re-charge the memories. 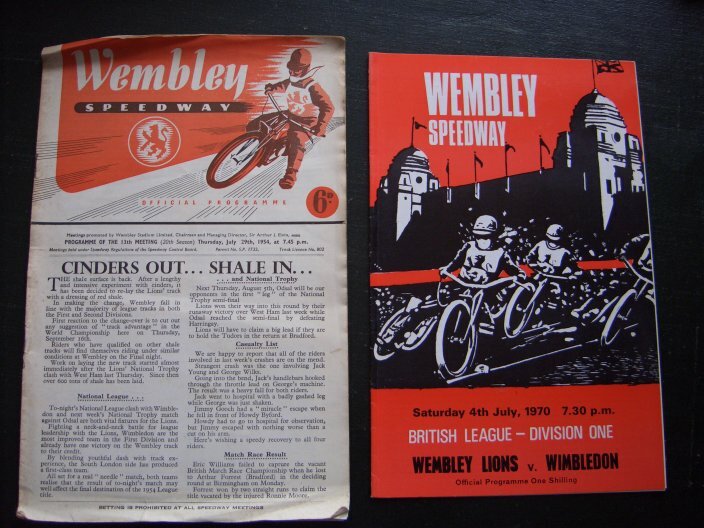 *Dear John, In response to the appeal by your correspondent, Ken Holbrook, who wishes to purchase a book on the Wembley Lions, the only one that might be suitable is "Speedway in London" by Norman Jacobs. 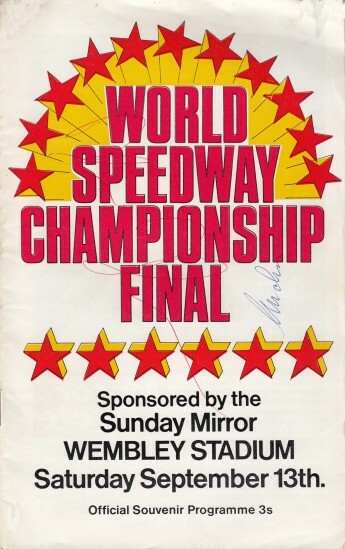 It is extremely unlikely that Ken would find a copy in any high street. 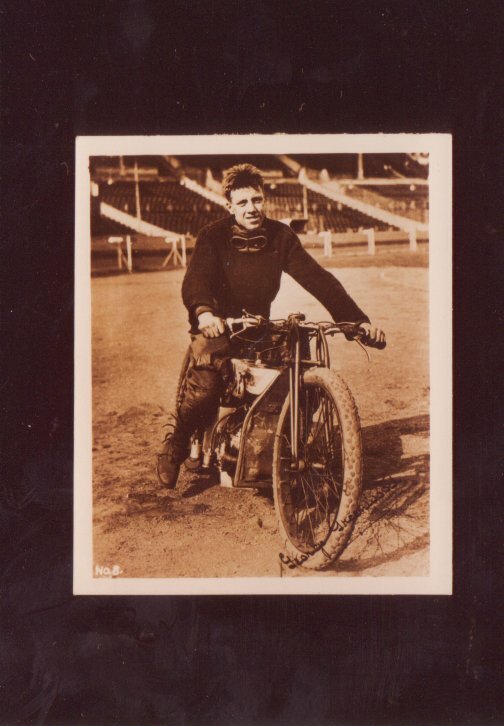 However, it is presently available from a large well known Internet retailer for £14.99 post free, or from various other booksellers from £7.67 plus £2.80 postage, through the same Internet retailer. 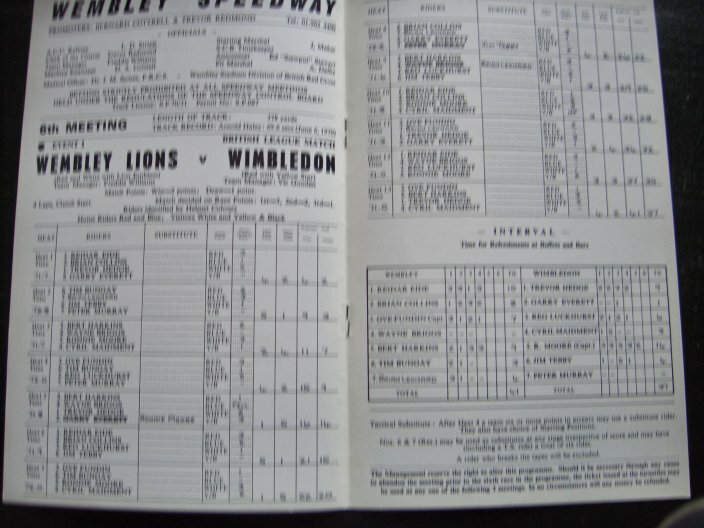 This particular book covers the history of all the London teams. 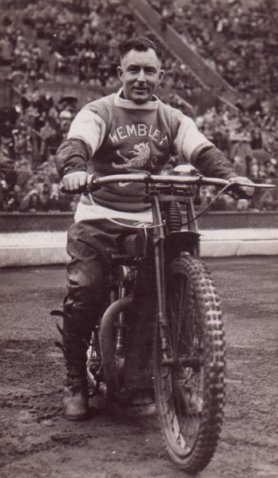 The chapter on Wembley runs to 27 pages and there is a photo of Tommy Price on the cover! 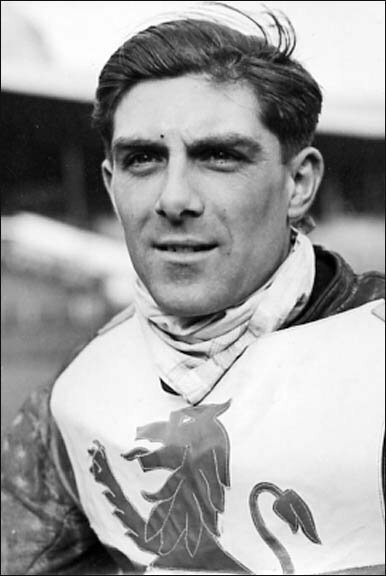 A friend through my website Fred Pallett says: Hello John, In view of the fame and success enjoyed by the former Wembley rider Tommy Price, it might not be widely known that there was another rider of the same name who appeared for Liverpool in the 1930s. 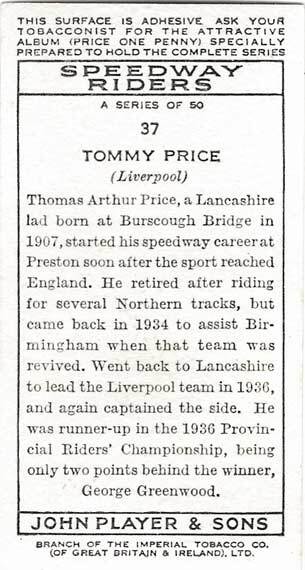 In your Player's cigarette card set, displayed on your Defunct Speedway website, Card No 37 purports to be the Liverpool rider, but I have my doubts about this. 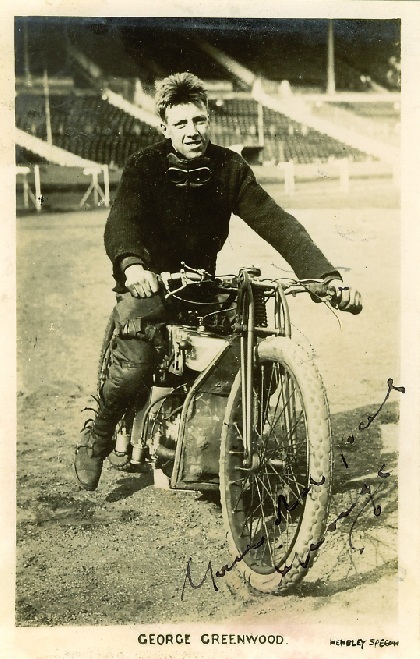 The first photo in the Liverpool section of the website shows that team's Tommy Price as it's captain, sitting on a JAP engined bike. 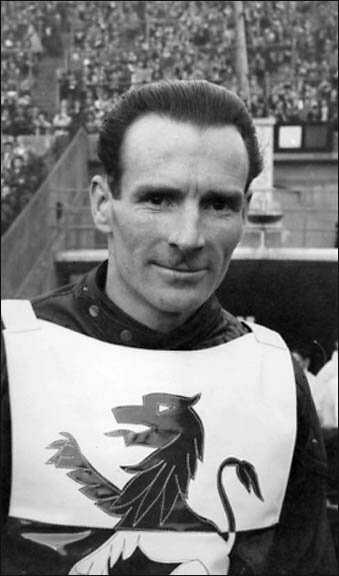 His grandson, Nigel Trafford, has confirmed this. 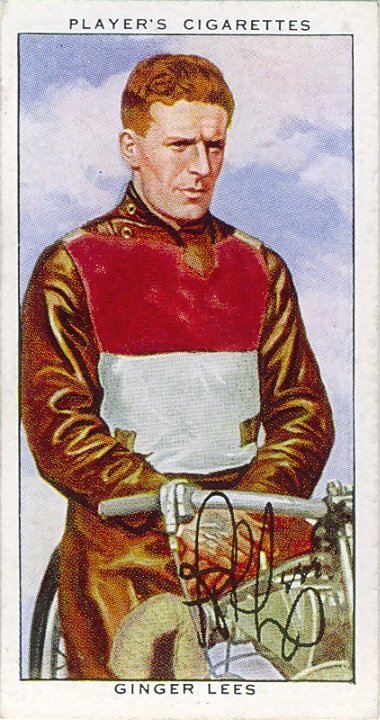 Having compared that photo with the card illustration, I fail to see any similarity between the riders. 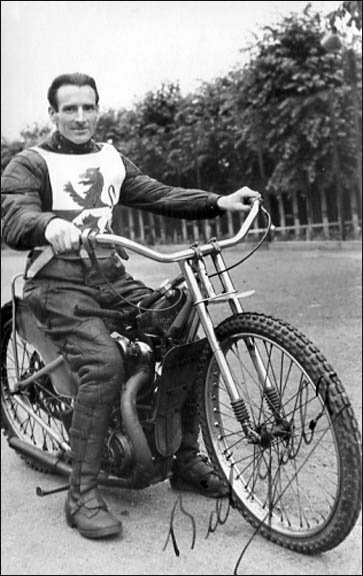 Conversely, I can see a resemblance of the rider depicted on the card to the photo of Tommy Price in the Wembley section of the website, dressed in a Wembley jersey, i.e. 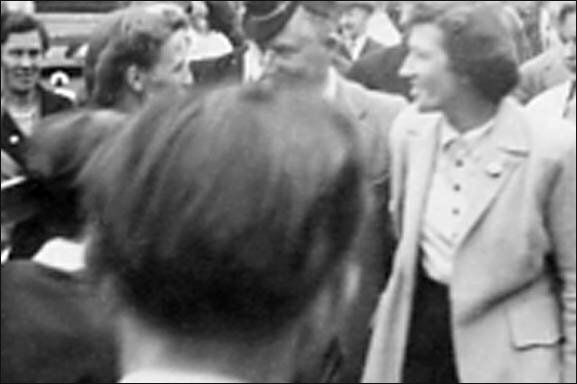 the sixth Price photo (taken possibly just before WW2 or perhaps just after it) that follows the group of Bill Kitchen photos. 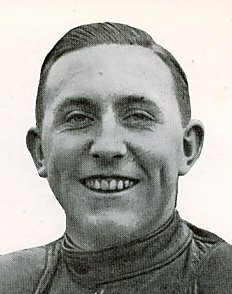 See also Price in the Wembley team photo for 1937, just above the photos of Eric Gregory. 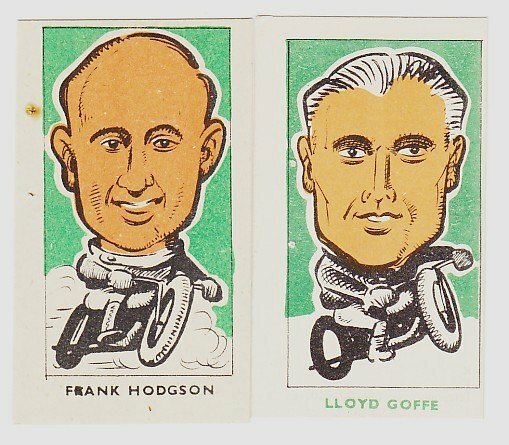 It is my belief that the card illustration is of the Wembley rider and, therefore, that the profile on the reverse is of the wrong rider. Perhaps someone can confirm my suspicions? 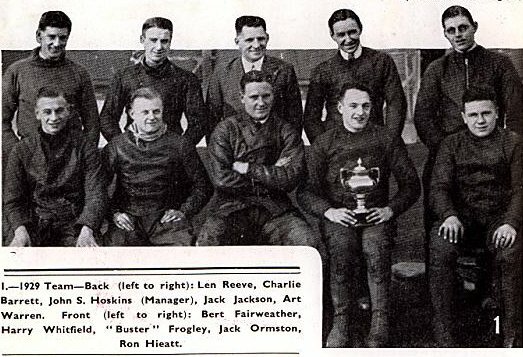 This is the 1936 Liverpool team with captain Tommy Price on the machine. 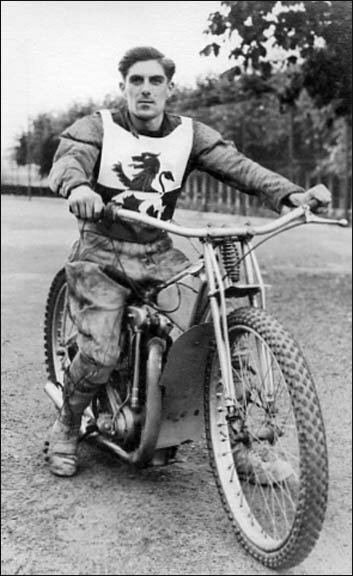 His grandson, Nigel Trafford, has confirmed this. But! 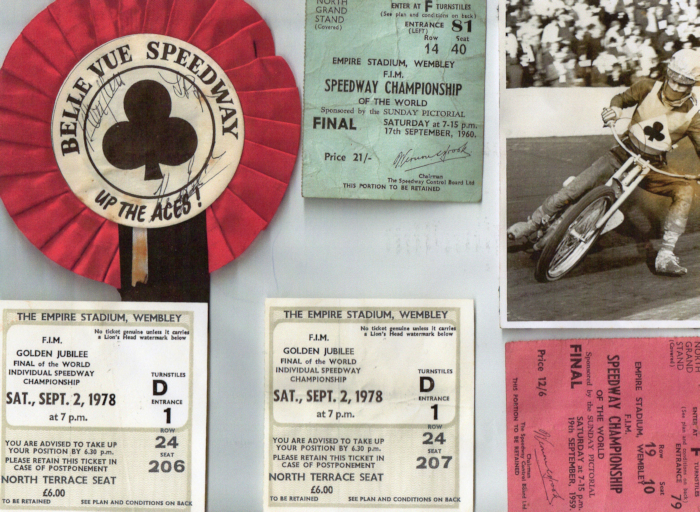 is the rider pictured on the above cig card the same guy as the Tommy Price on the bike in the Liverpool picture? 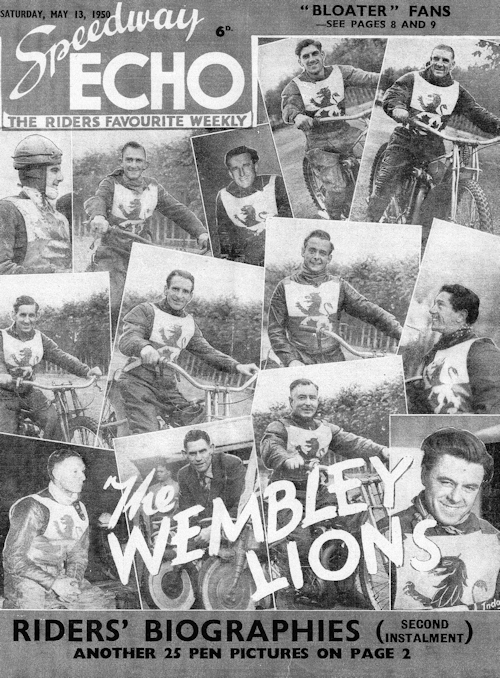 The 1937 Wembley team. 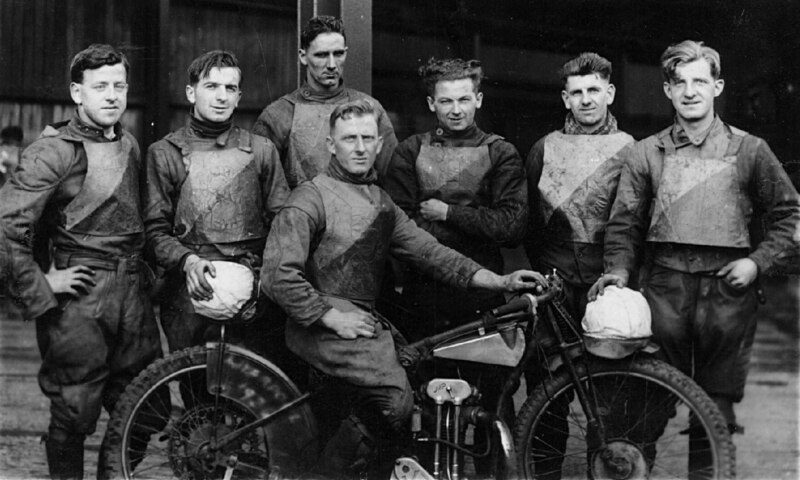 I think Tommy is 3rd from the left. 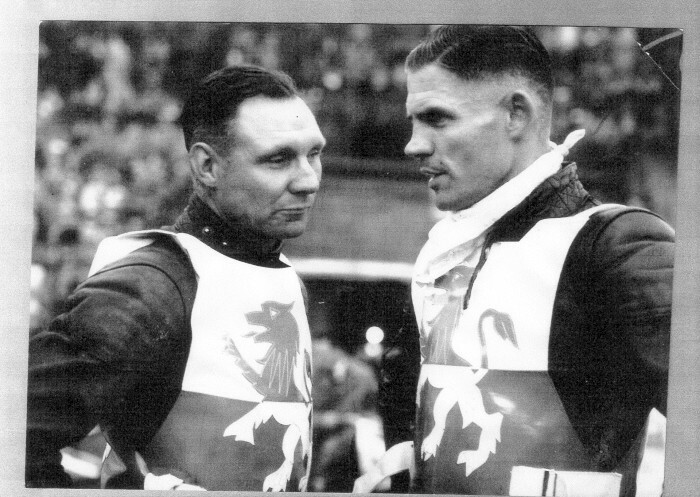 John says in answer to Fred Palletts question above. 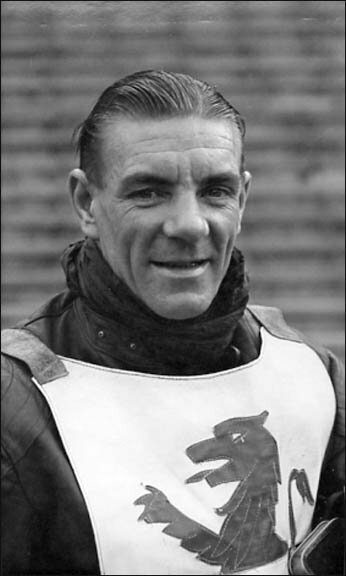 The Liverpool Tommy Price does not seem to have very prominent ears whereas the Wembley Tommy Price does. 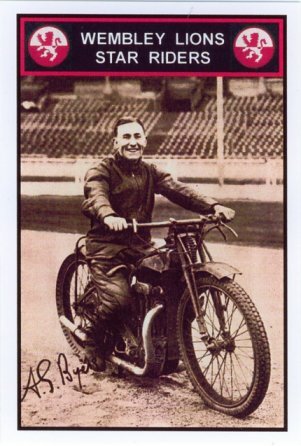 The picture on the cigarette card does look more like the Wembley rider. It has his ears and smile BUT! 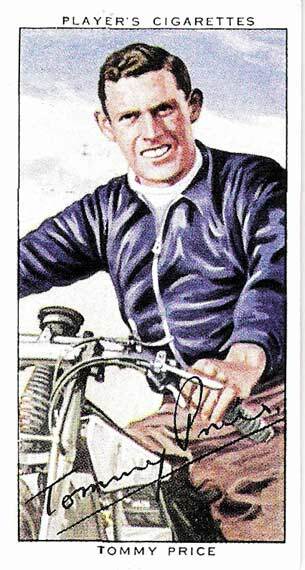 as the cig card is a piece of art and not a photo maybe it is just a poor sketch of the Liverpool rider? 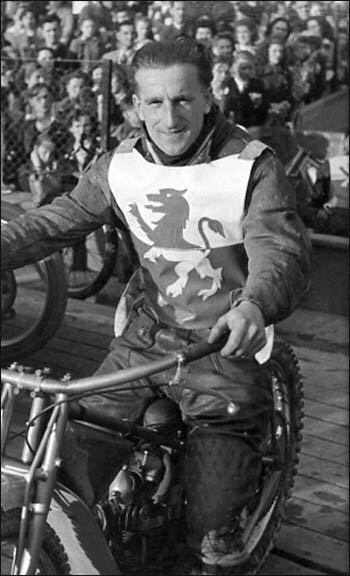 Derek rode for Newcastle for a while. 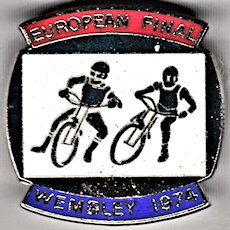 Did Newcastle ever ride at Wembley? 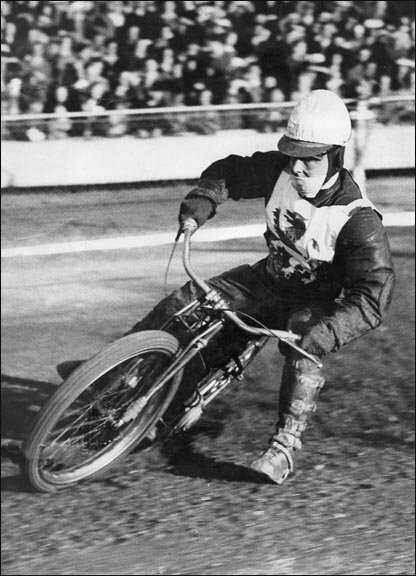 Reg Fearman says: Waterman and Close, it is certainly not Wembley - too untidy. 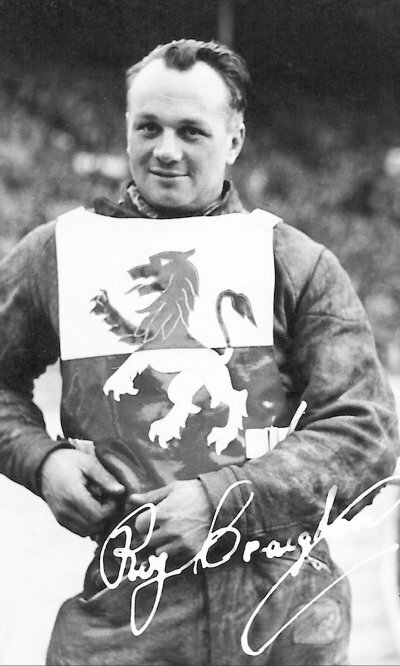 Derek's body jacket could be red, blue, white or yellow. 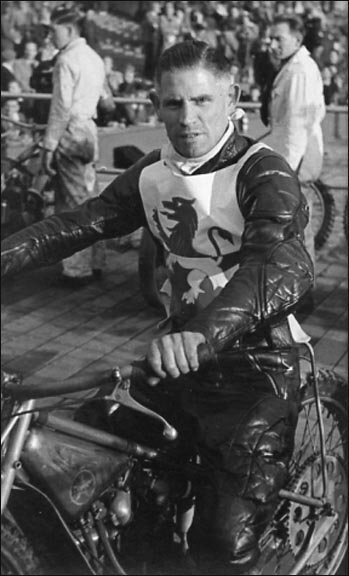 If a rider turned up without his race jacket which was common the staging track would " kit " him out. 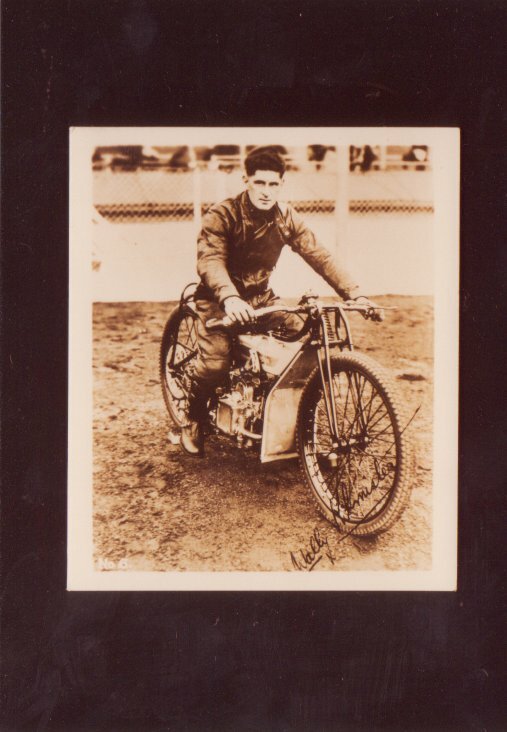 "Fred Williams' granddaughter Harriet has been in touch and has sent 5 of the following 6 photo images:"
The photo (shown above) is on the front cover of Fred's funeral "Order Of Service" I have permission to show it. 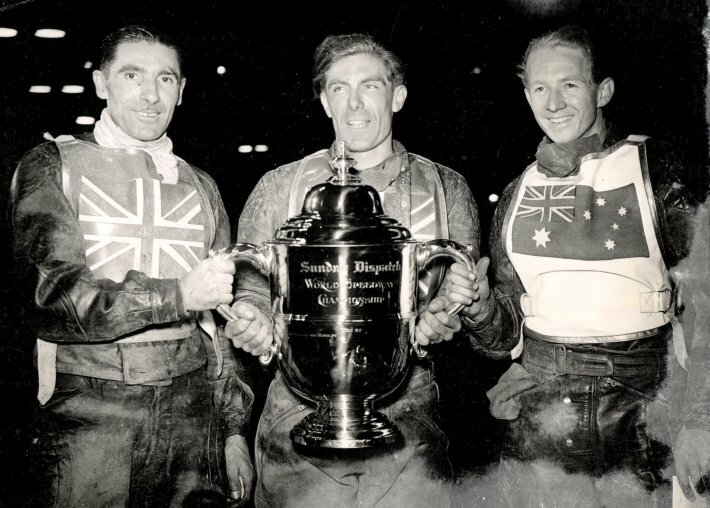 "Fred Williams (centre) holding the World Championship Trophy for 1950, with Wally Green (runner-up, left) and Graham Warren (third, right)." 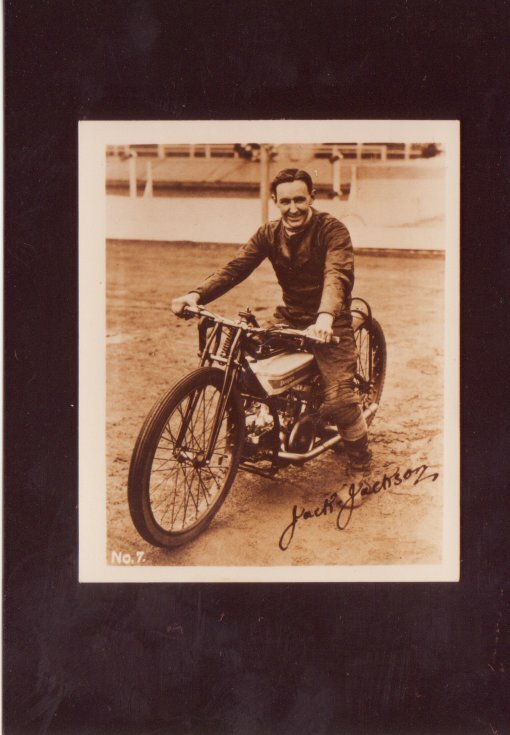 The photo (shown above) is on the back page of Freds funeral "Order Of Service." I have permission to show it. 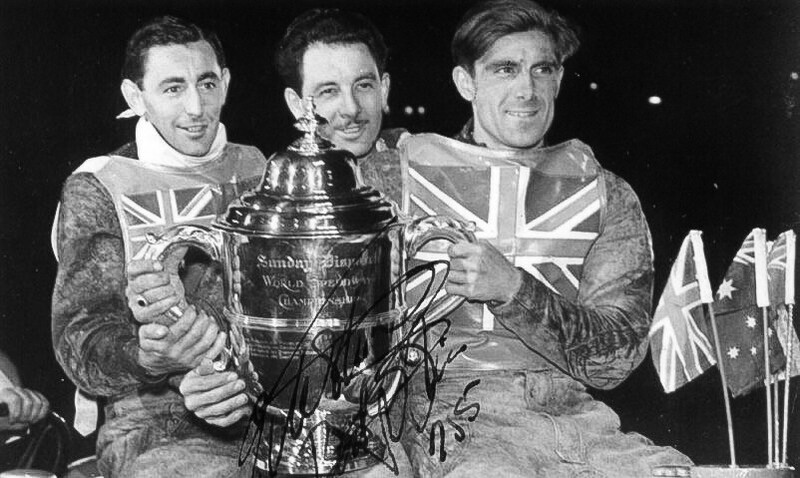 Fred Pallett says: Re above "Fred Williams (right) holding the World Championship Trophy for 1953, with Split Waterman (runner-up, centre) and Geoff Mardon, third, left)" This image, which might require resizing, is included in Part Six of Reg Fearman's photos, but I cannot think that he would object to it being included here. 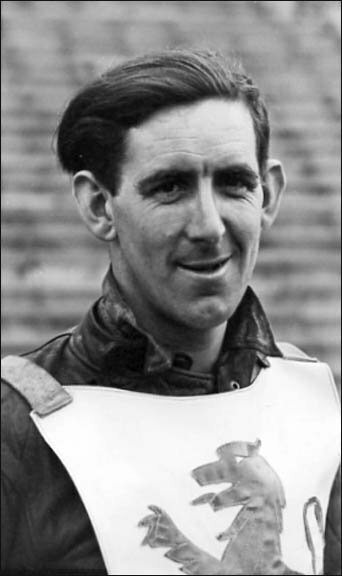 Bob Oakley arrived at Wembley from Southampton in 1951 and made an immediate impact. 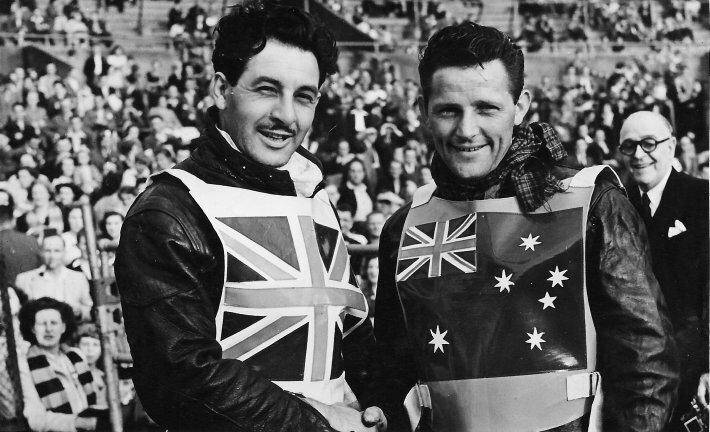 New Zealander Abernethy had arrived in 1948 and was a dashing and flamboyant rider, and always enjoyed life, as can be seen by the effervescent smile on his face. 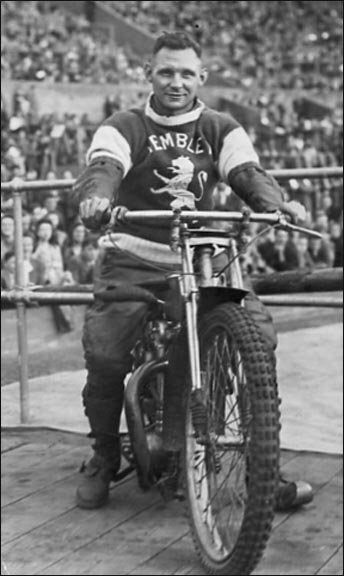 The shot of him riding in a black and white jumper is rather puzzling and I can only assume that he was representing his country. 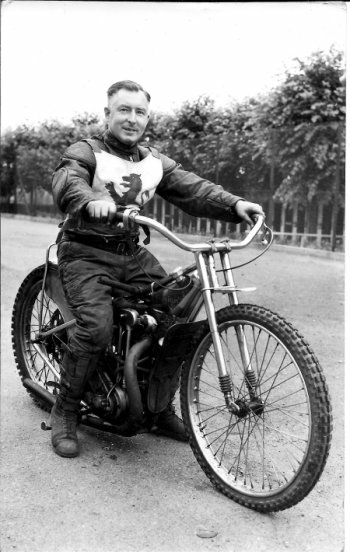 2 Pictures of Alf Bottoms from 1949. 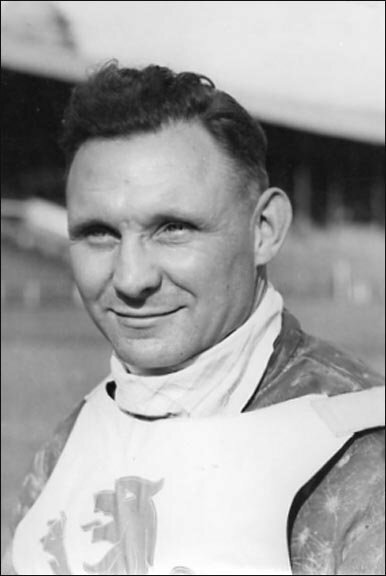 He died away from speedway, in a racing car accident. 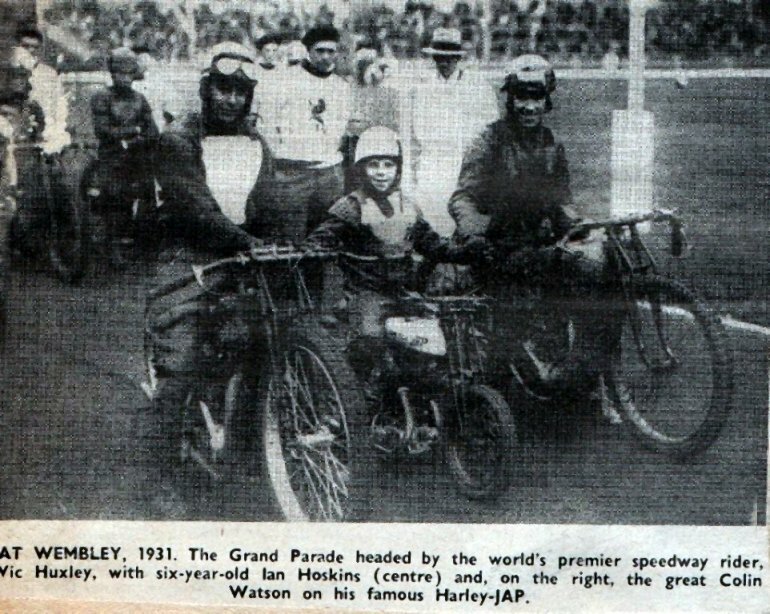 Fred says: These are the photos shot with my box camera back in 1950 (the fuzzy ones), when the Wembley Speedway management hired a British Railways train to take the Supporters Club and most of the Wembley riders to Southend-on-Sea for the day. 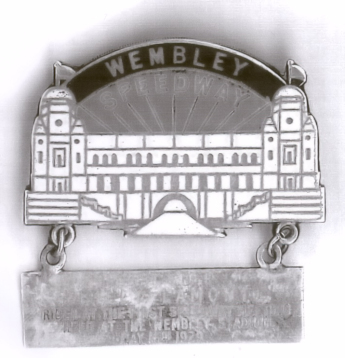 This made an early start for me and my fellow Wembley supporting pal Ralph Ambrose, since we had to travel right across London first, by train and underground train, to make the special BR train. 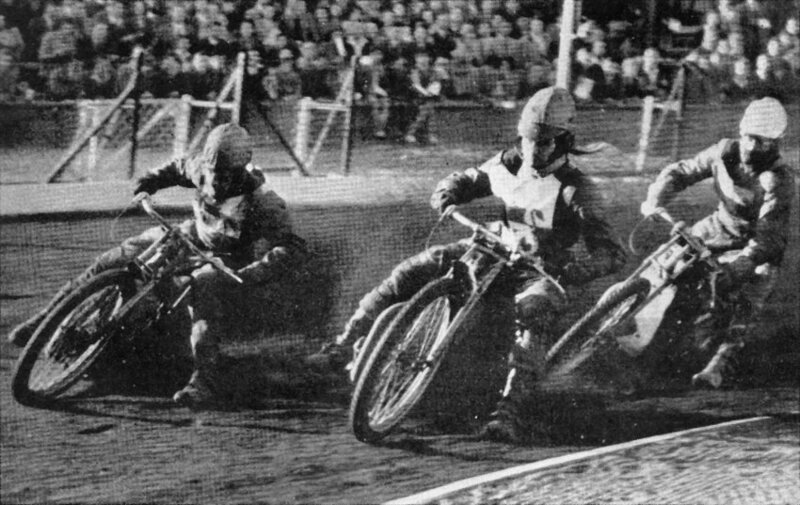 All the shots were taken in the Kursaal (some indoors without flash), which was a permanent amusement centre that was more like a glorified fairground, although it had other attractions, including a ballroom. 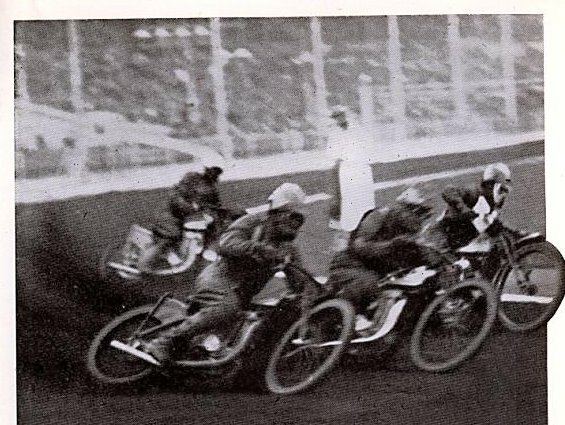 The Kursaal is still there, although only about a quarter of its original size, because the remainder of the site was sold off for a housing development. 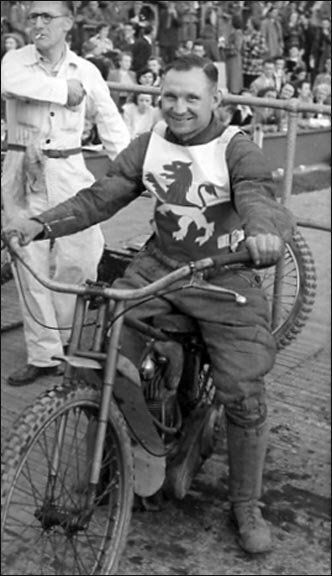 Wilbur Lamoreaux - This American came over to ride for the Lions just for 1948, when Wembley were obliged to relocate to Wimbledon for home matches for three-quarters of the season, because of the Olympic Games being held at the Empire Stadium. 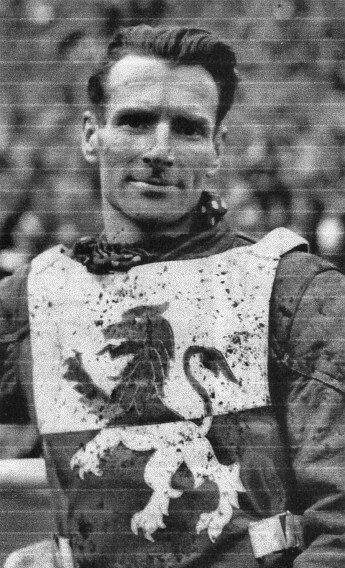 Bronco Wilson – The first photo shows him in a Wembley jersey and was taken in 1946, whilst the other shot was taken the following season. 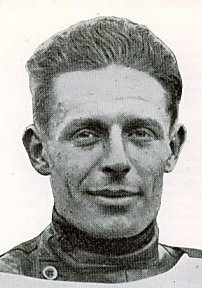 Unfortunately, Bronco met an untimely death when he died from injuries sustained in a track accident at Harringay in August 1947. 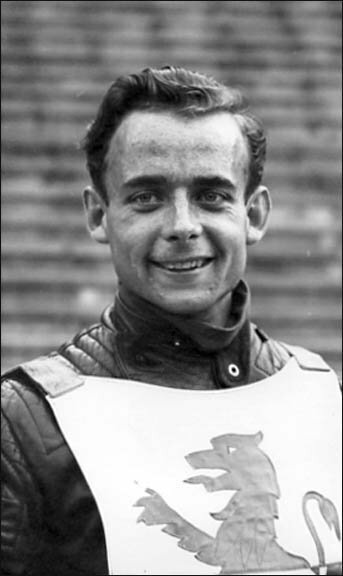 Kenny Holbrook says: Thanks for the information. 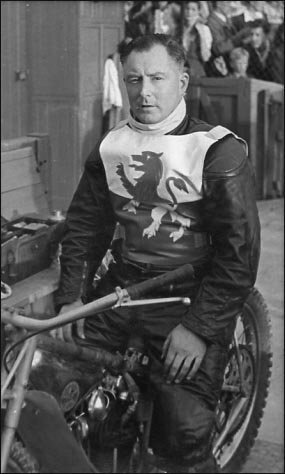 Since we last corresponded, I have recalled another rider who I believe was 'Bronco' Wilson. 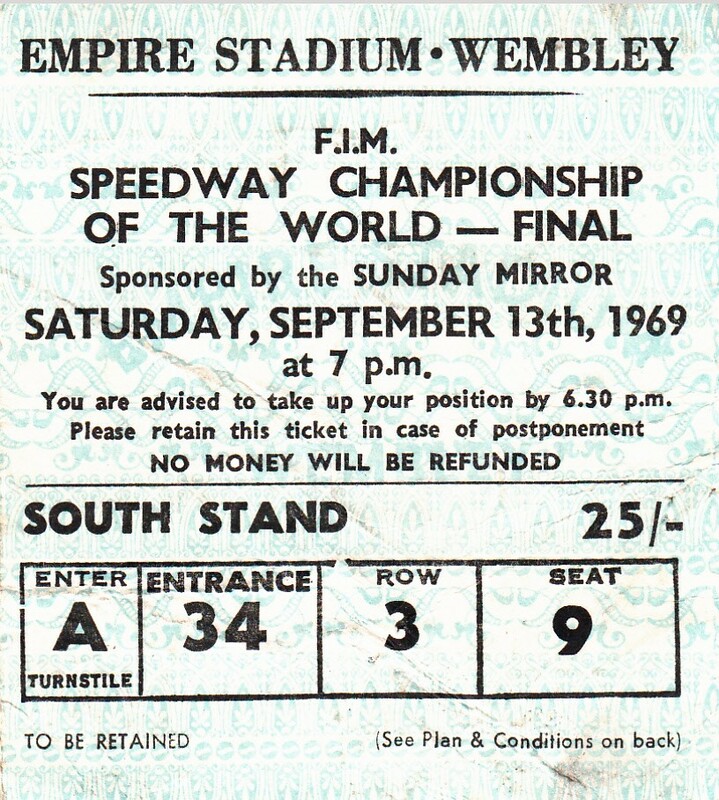 My memory might be failing me but I seem to recall his fatal crash at Wembley on the first corner, where he collided with the fence. John says: Hi Kenny, your memory is playing tricks. 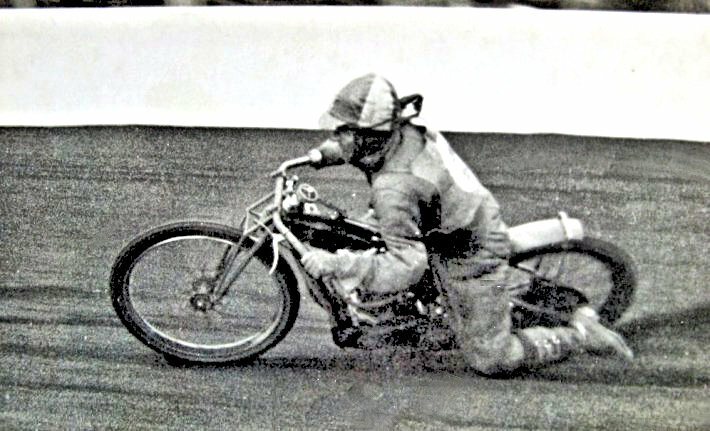 As you can see from my above piece Bronco's fatal crash was at Harringay in 1947. 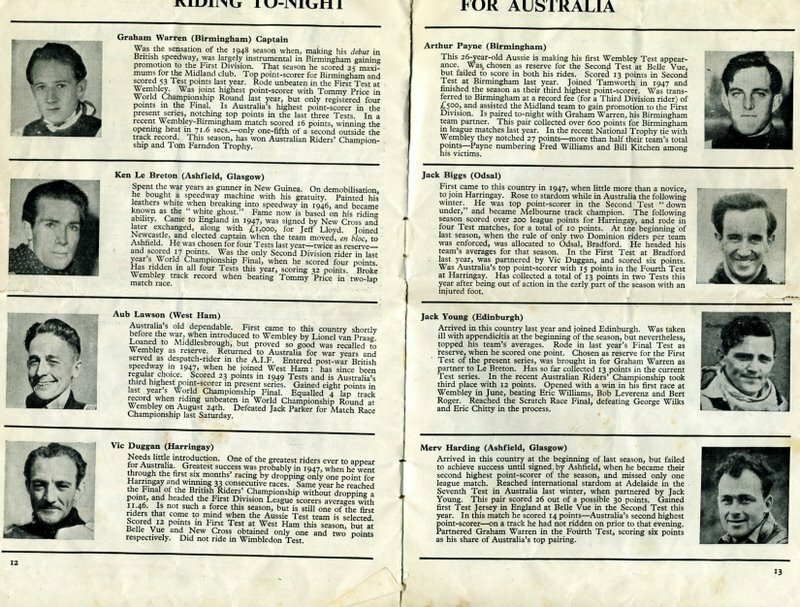 Kenny adds: Thanks John. Half right. 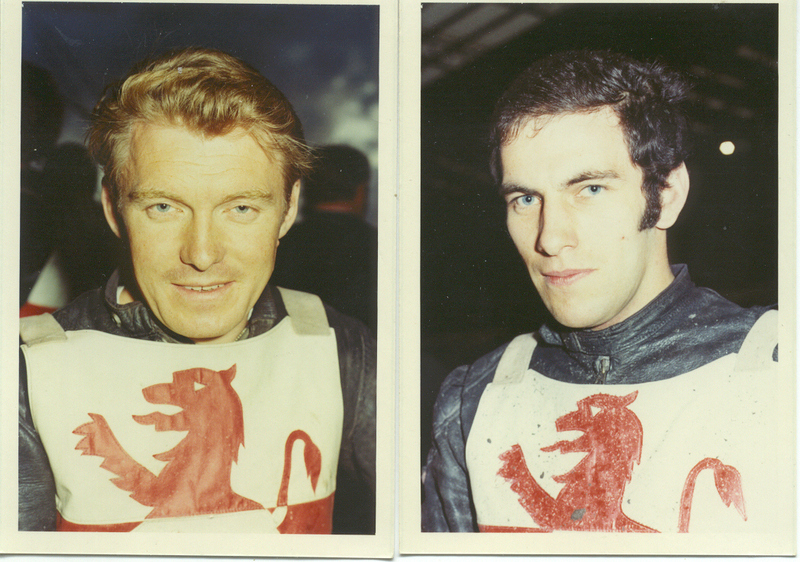 Dad had taken me & my Uncle to Haringey. 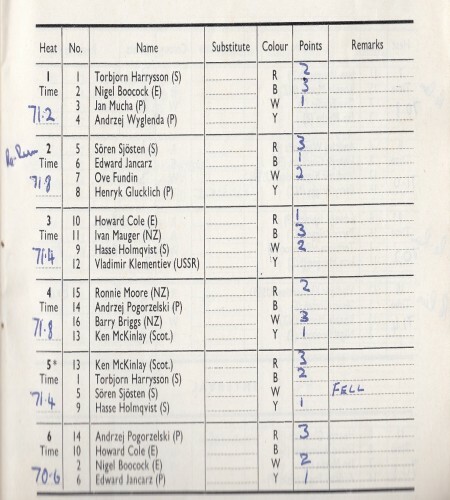 I do remember a lady next to us fainting, whilst others were crying. 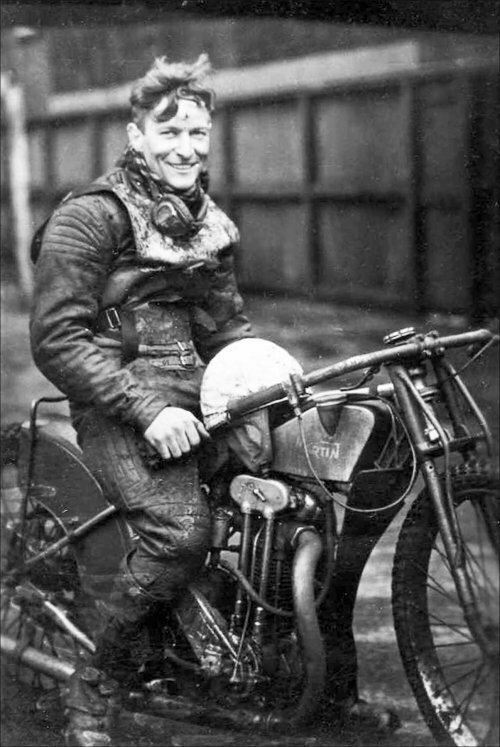 John says: I'll bet Horatio Nelson Wilson was happier being known as Bronco! 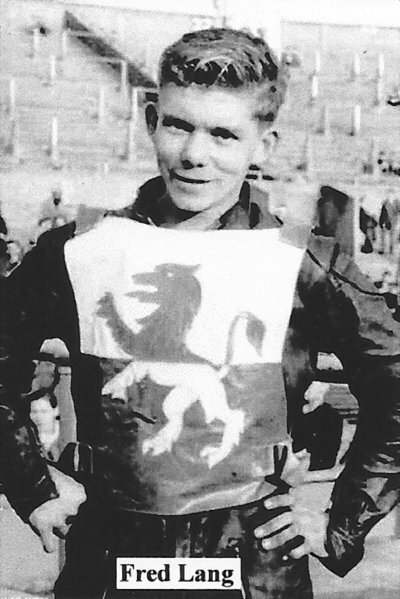 Fred Lang – A young South African rider who appeared for Wembley for one season in 1954. 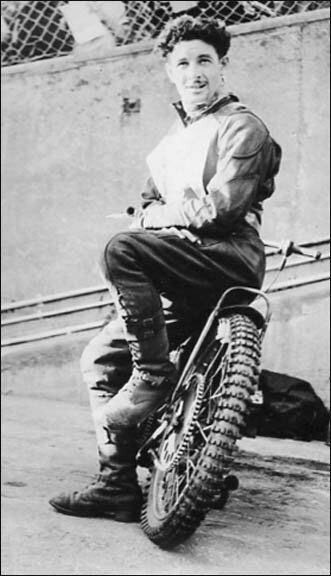 He never rose above reserve status and was not retained. 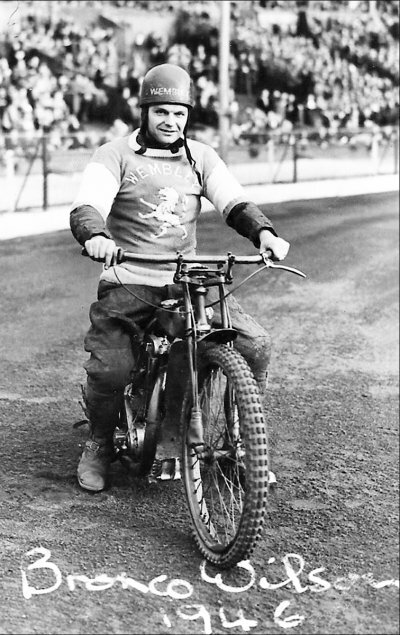 Roy Craighead – Rode for Wembley in 1947 and 1948. 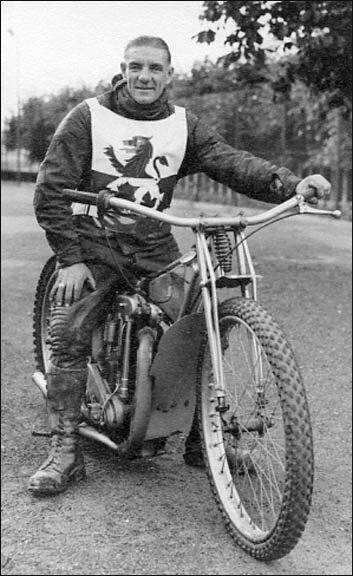 Better known as a West Ham rider but here is Aub in his Wembley days. 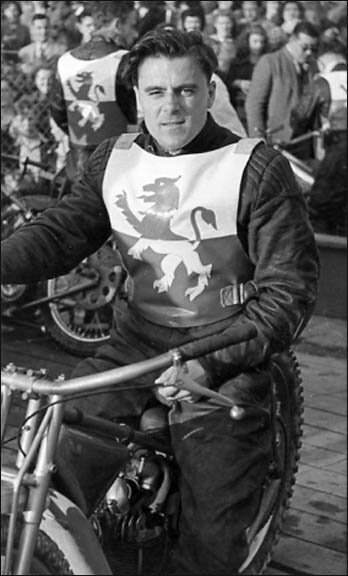 Chris Wallett says: I Haven't sent you anything for a while but your website is still looking great! 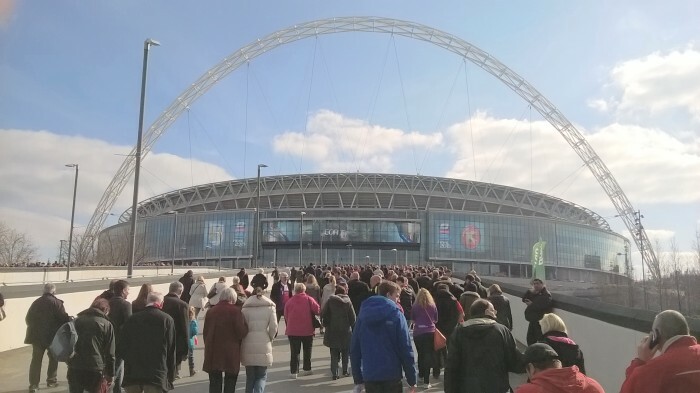 Spent Sunday watching a football match at the new Wembley Stadium (photos are above). 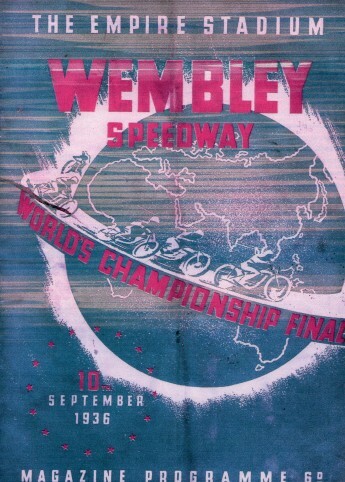 I went to the old Wembley quite a few times but never saw speedway there sadly. 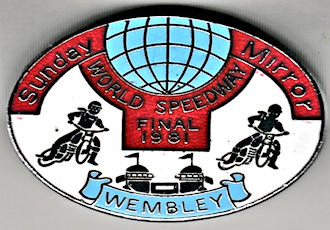 This was my first visit to the new Wembley and I have to say its very impressive so thought you might like these pics to bring the Wembley webpage up to date. 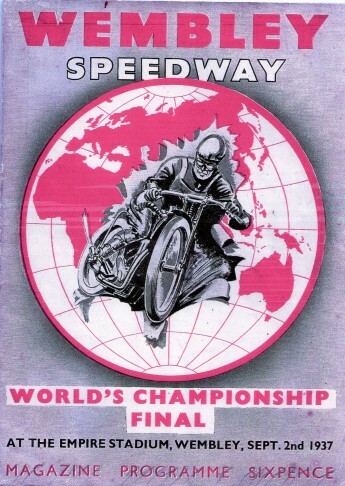 The stadium looks like it could well hold speedway its big enough and the right shape with possible pits access. 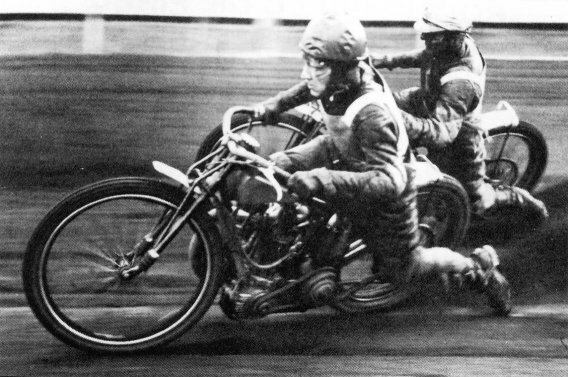 Don't know if the new arch will ever echo to the roar of the bikes like the old twin towers did. 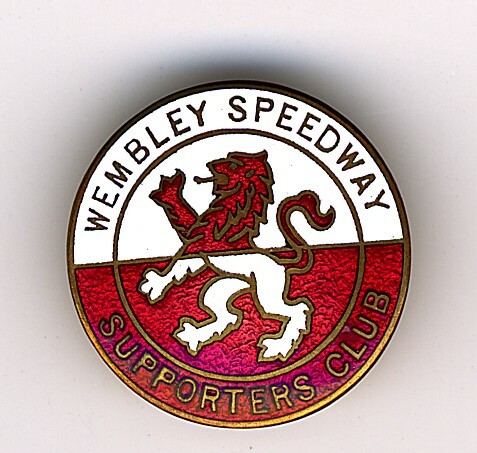 Only time will tell but knowing how desperate the FA are for money to pay for the stadium never say never.